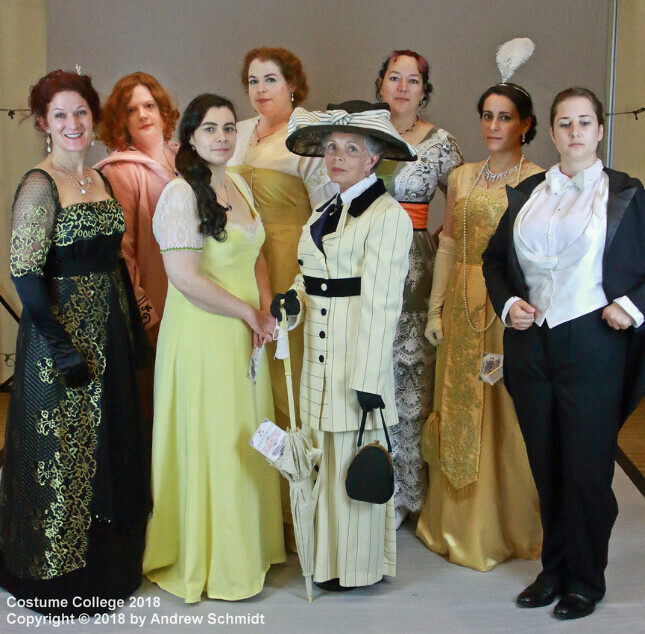 Costume College was wonderful, as usual. I really didn't take that many classes this year at all, which was actually kind of nice, as it left more time for socializing. And yet, I still wish I had had more time to see everyone and do everything! 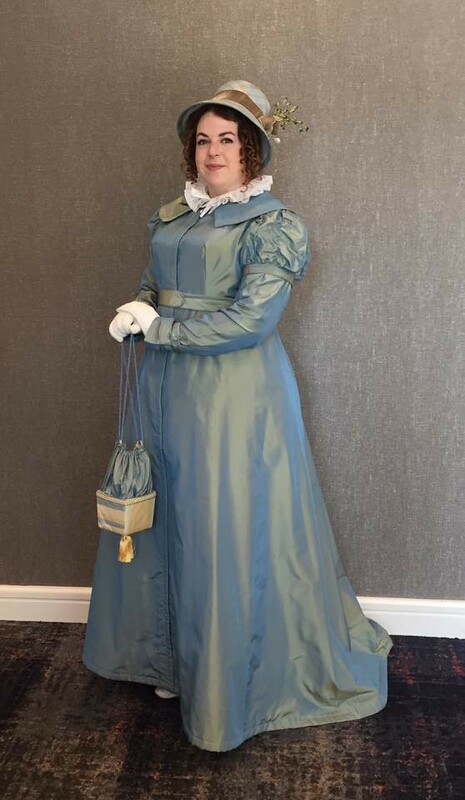 I will (hopefully) do wrap-up posts with pictures of what I wore when, and details on the classes I took, and what I purchased, etc. But for now, since it's all mulling around in my mind, I want to get down in writing what I hope to accomplish for the next year. 2018-19 is hopefully going to be a year of filling in gaps and using up stash. 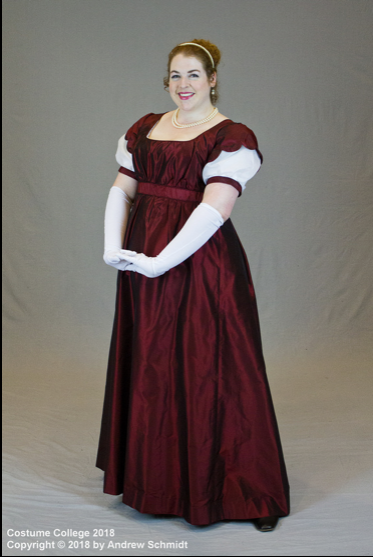 There's just a few styles I'm missing in my costuming, most of which I would like to remedy. And since I literally bought one piece of fabric in the fabric district (yesterday's shopping trip was pretty frustrating, to be honest), pretty much everything is either going to have to come from my stash or be able to be sourced locally, which is a little scary. And the other scary part is that at this point, I have only one completely concrete plan, which is very unlike me, and it's actually a plan that has been pushed off from year to year, which I'm determined to finally make this year. -An Elizabethan ruff. I took the ruff class on Sunday, and it was so good. Em Bee gave me half a yard of linen yesterday (he is so nice! 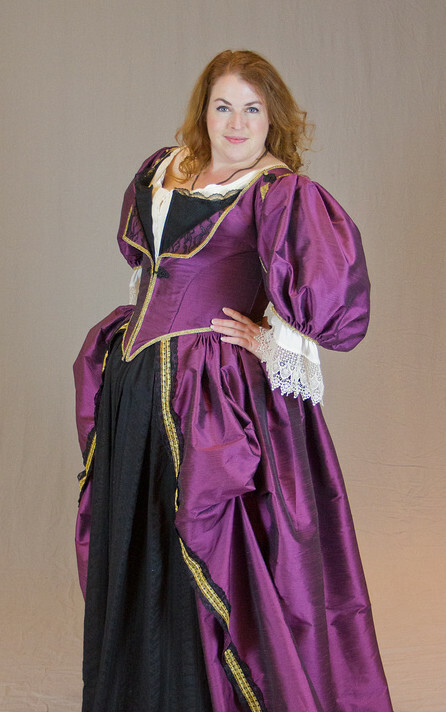 ), and I'm going to attempt to make this before the Ren Faire on Saturday. 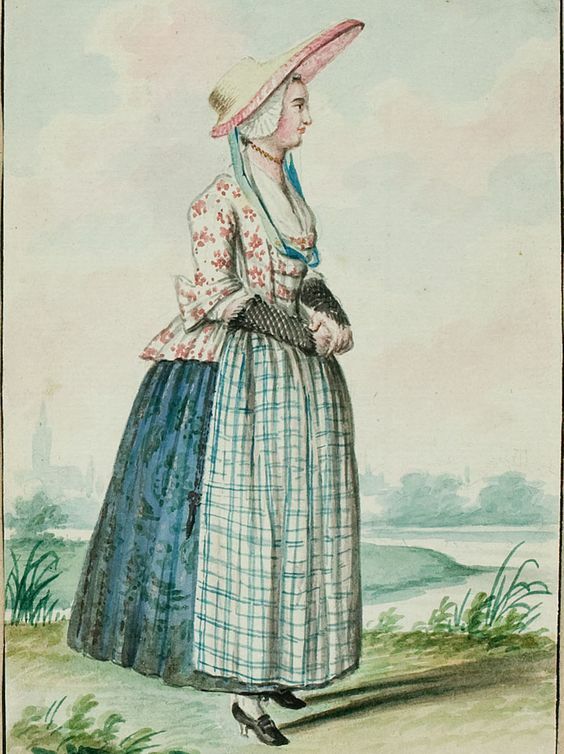 -An 18th c working class outfit, with ankle-length skirt, probably some sort of short jacket, apron, fichu, cap, possibly hat, all in different colors and patterns. 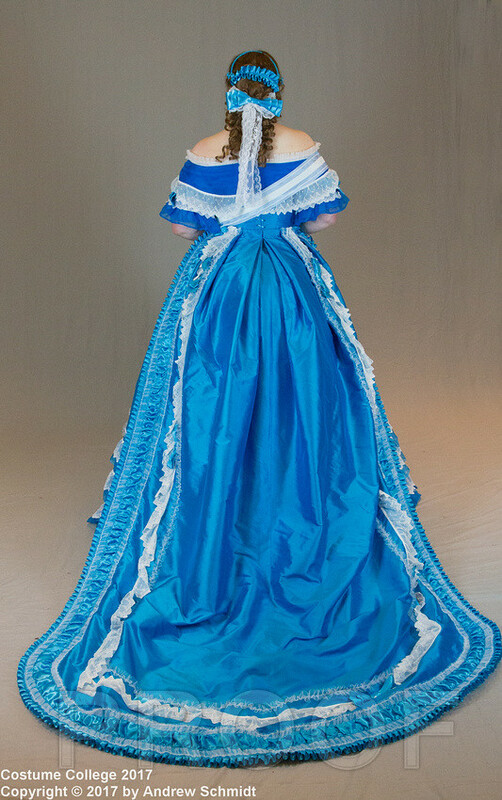 I also want to make the new American Duchess stays pattern for this, since both of my existing stays are not very comfortable. -An s-bend corset. 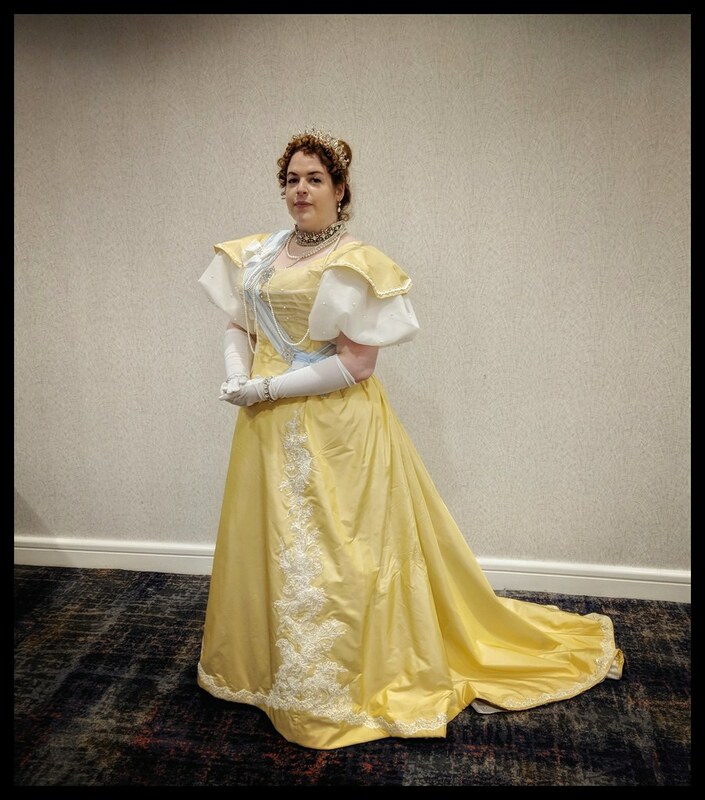 Ideally, I'd love to make the Edwardian dress I didn't get to this last year to go over it, but I'd still have to source the velvet ribbon, so I'm not sure that's going to happen. 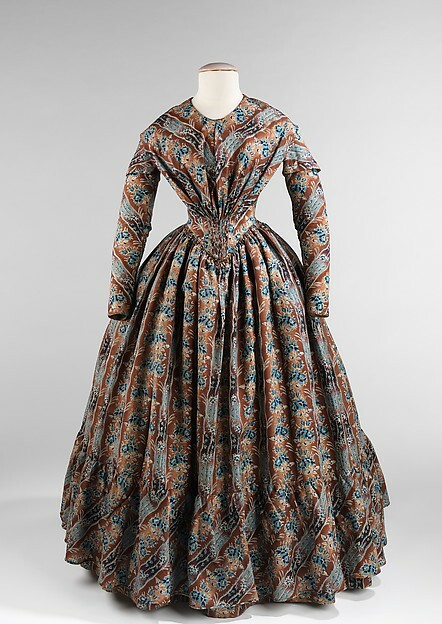 -A cotton 1840s dress. Something like one of these. 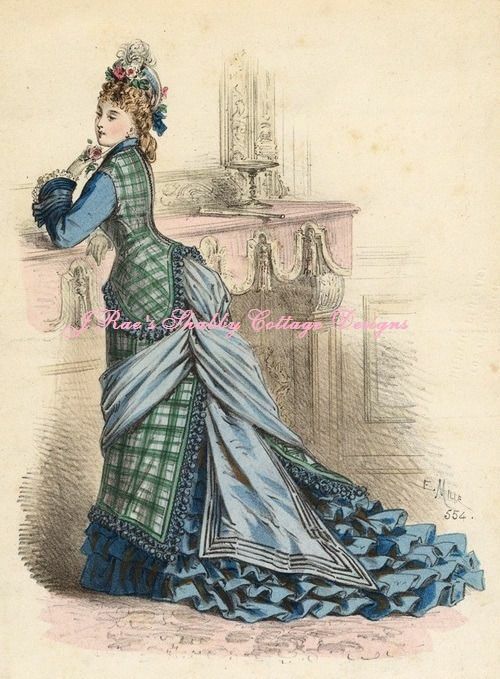 -The blue riding habit from Daniel Deronda. Yes, I'm finally going to get to this. It's been on my list for how many years? 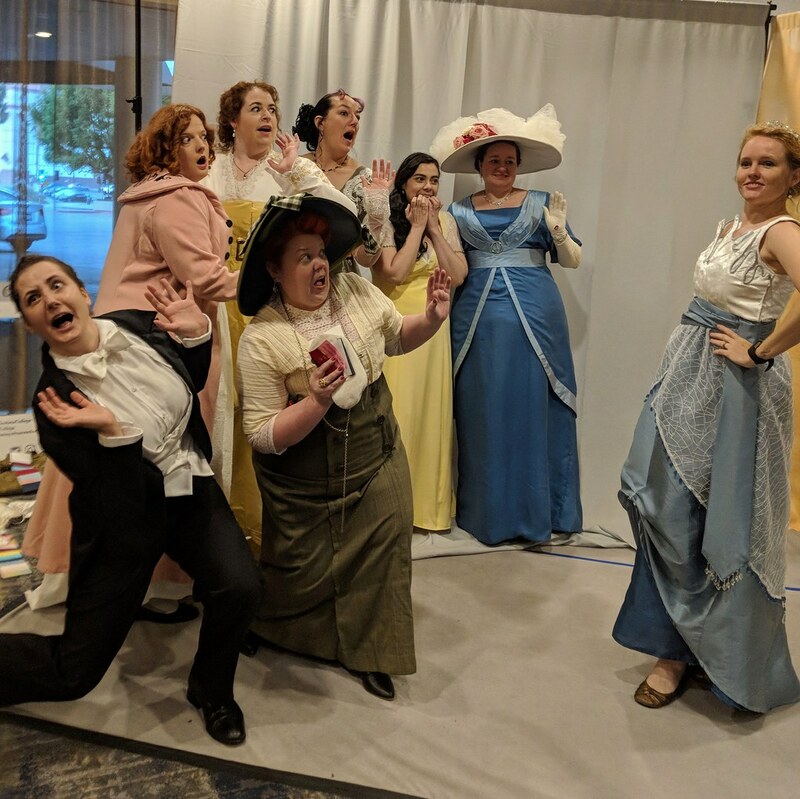 We're going to do a Daniel Deronda group for Friday during the day next year, which means this will actually get done, since I love group projects. 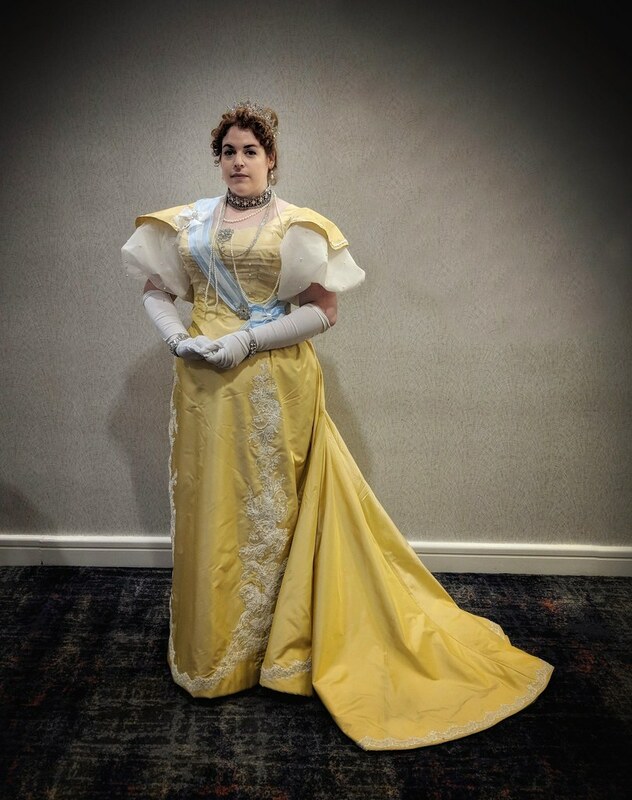 -A Disney Bustle Gown for Friday night next year. 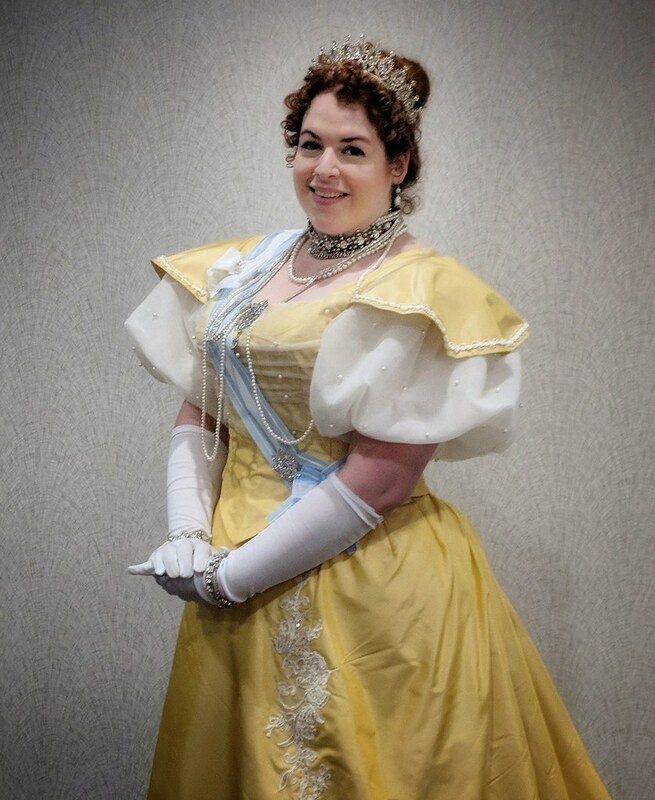 I'm almost positive I'm going to do the Fairy Godmother, based on this extant dress, but turning the back tails into a giant hood. 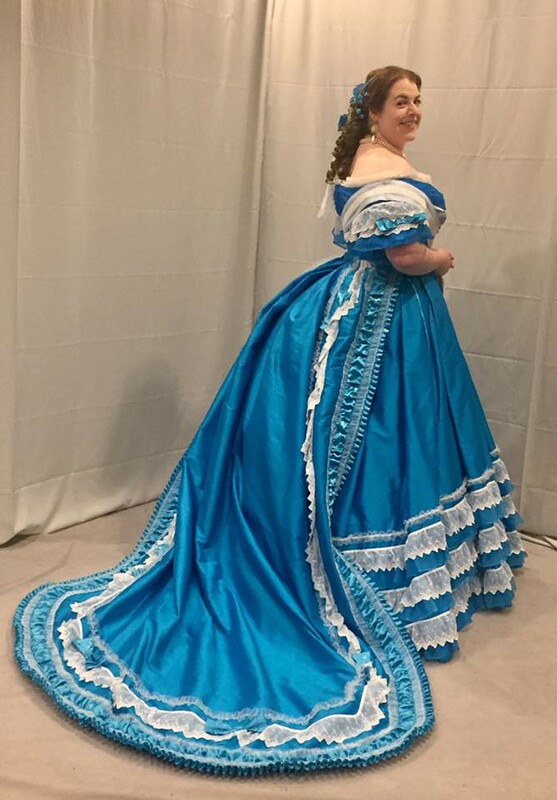 I'm fairly certain I purchased enough blue silk for this last year, but I couldn't find any pink silk in the fabric district, so that may be the only thing that prevents me. Or I'll use poly, since it's just the accent color. 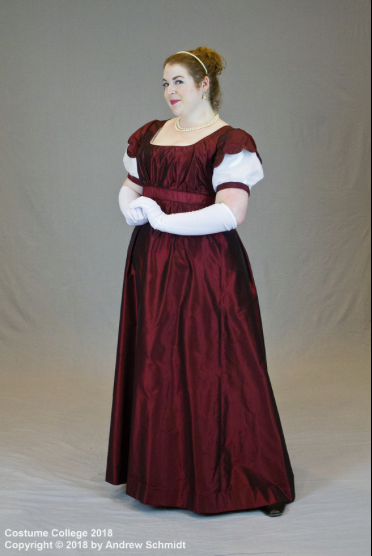 Or maybe I'll cut up my court gown petticoat, since I doubt I'll ever wear that again. 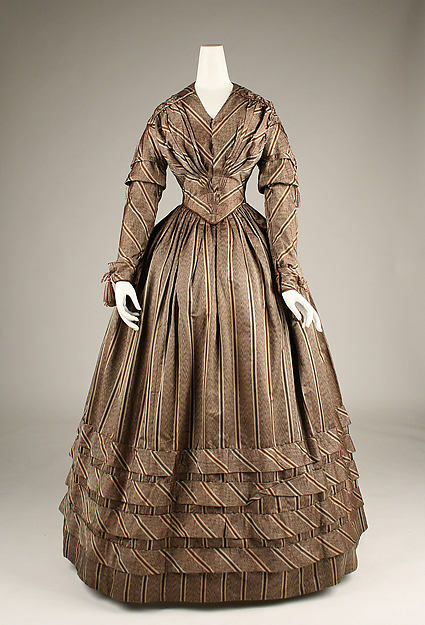 -For the gala, I think I want to do a natural form bustle gown. I have never done natural form, but the problem is that I'm still not a fan of most of it, especially for evening-wear. This plan might very well change, as I didn't find any good fabrics for this in the fabric district yesterday. 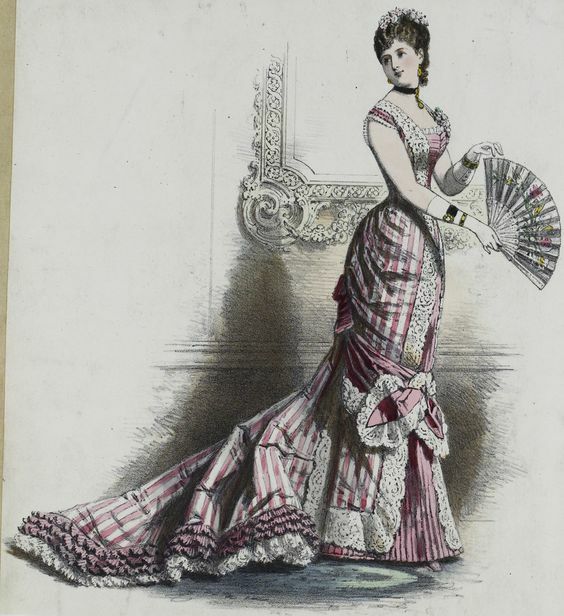 -A hot pink and pink plaid bustle gown. 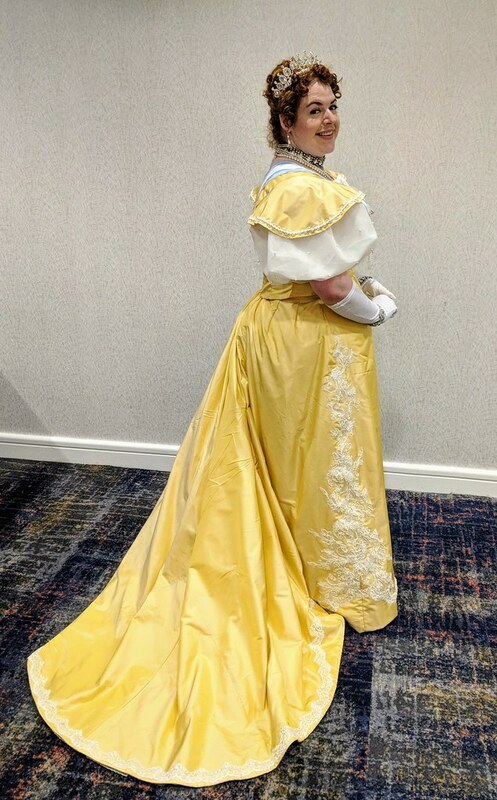 I might do this as a natural form instead of the gala, because I seem to prefer the natural form day-wear, though if I can make this color combo work for the gala, then that may be another option. I picked up the pink plaid last year, and found a solid pink (dupioni, but with very little slubbing) yesterday in the fabric district. 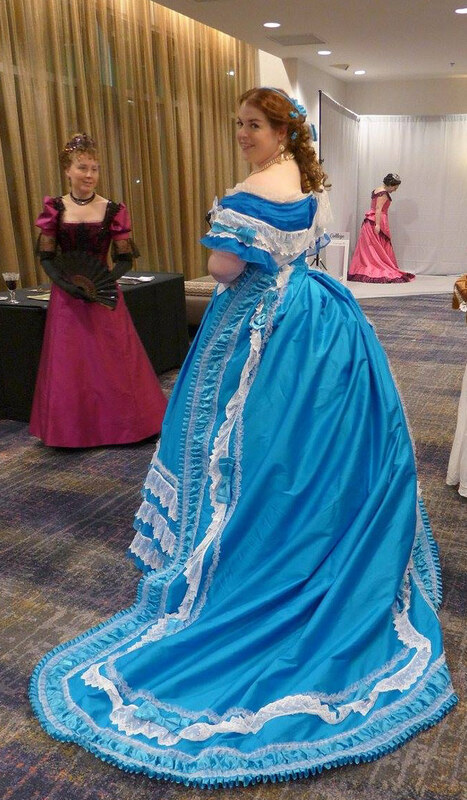 So basically, I'm doing a whole bunch of bustle gowns next year! Ack! 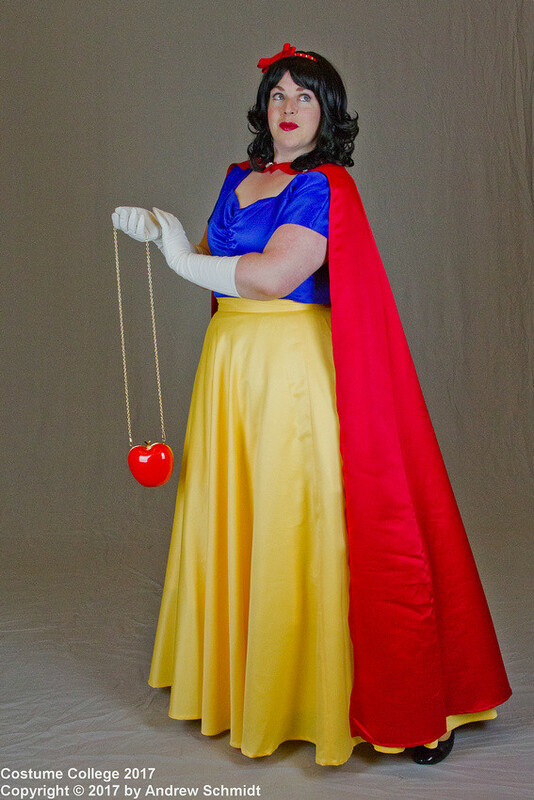 I'm flying down to Costume College three months from tomorrow morning. Where has the time gone? Anyway, for my own sanity, and if anyone is interested, here's a breakdown of what I'm planning to wear to CoCo, and their current status. 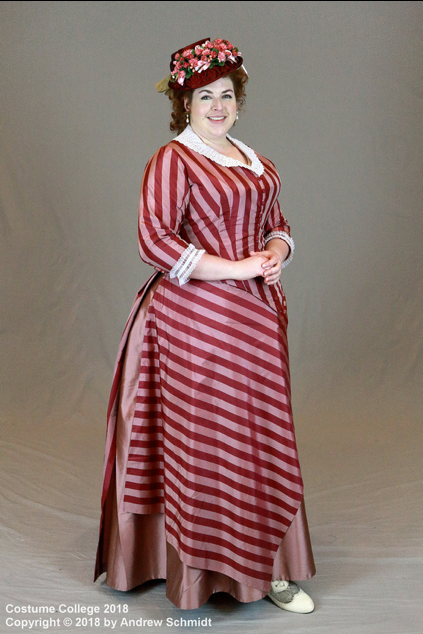 Thursday Pool Party - Red Silk Regency Laughing Moon Dress - needs sleeves, hem, skirt trim. 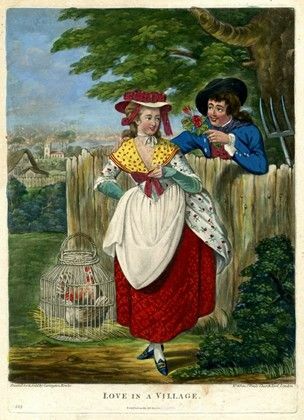 Maybe a bonnet, but I might not bother. 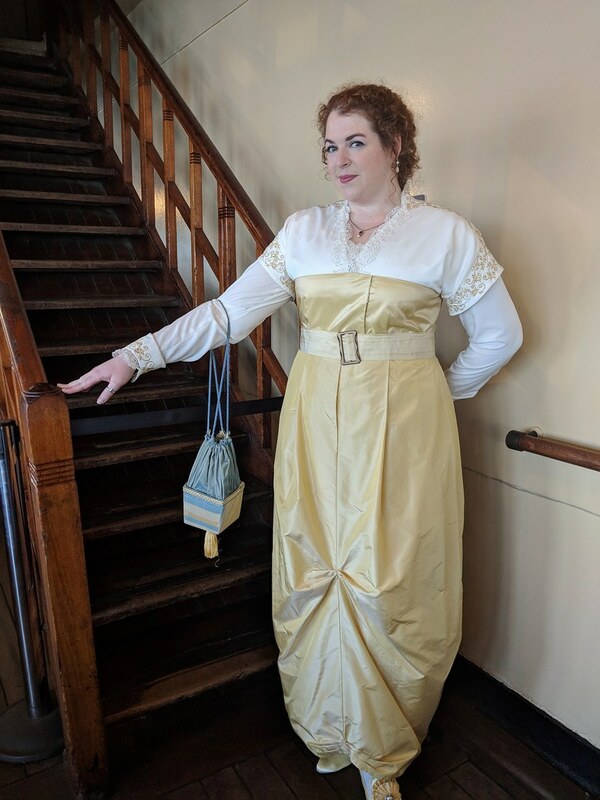 Saturday Gala - Yellow silk 1890s evening gown from the Hermitage - not started. 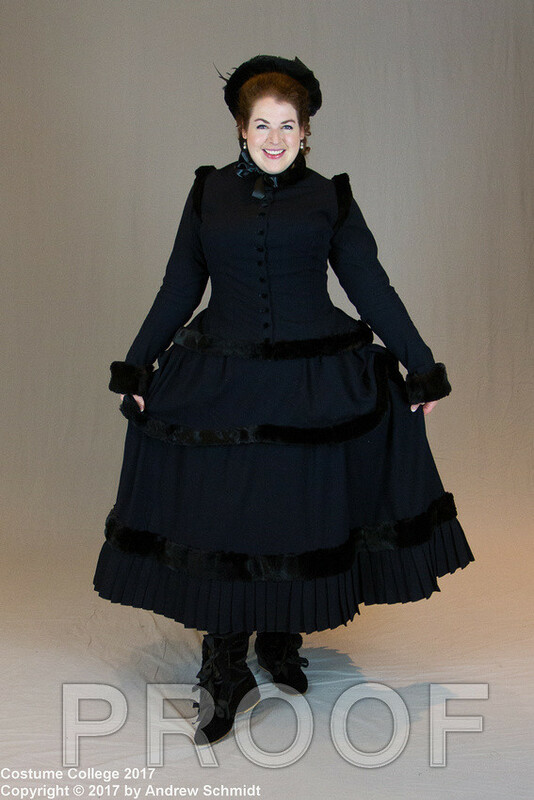 I also plan to make a new corset and petticoat for this. I think I'm in an okay place, especially since I most likely won't have rehearsals from May through CoCo. 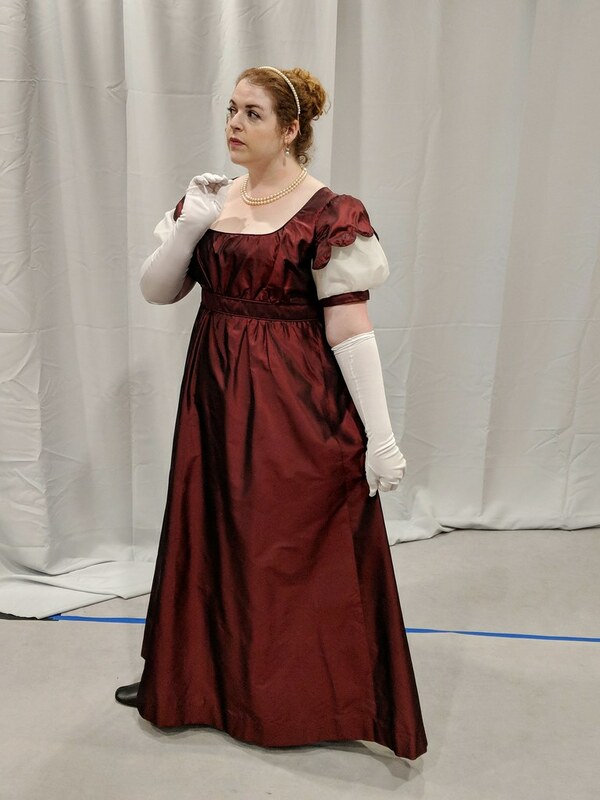 The gala gown will be a lot of work, but the shirtwaist/skirt should be relatively simple, and the Regency dress doesn't have too much left to do on it. I think it might also be slightly less of a nightmare to pack this year. 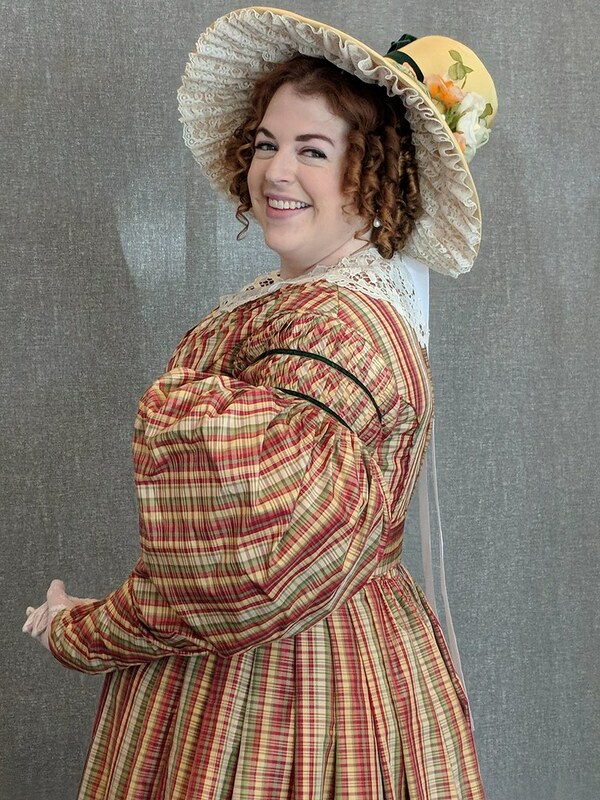 The only thing besides the gala dress that will be difficult for packing is the yellow bonnet for the 1830s dress, but I can always carry that loose on the plane if I need to. Of course, I'm still unsuccessful in overlapping undergarments. 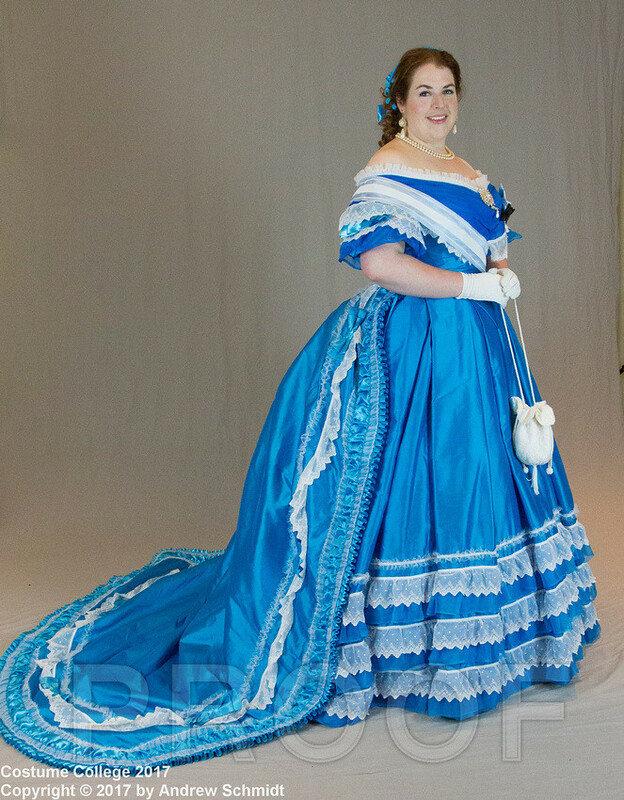 This will require 4 different corsets, 7 different petticoats, and at least 4 pairs of shoes. Wow, look - Saturday's post already! I believe I just took two classes on Saturday - Heirloom Sewing Techniques, and Tailor's Canvas. Both were super useful and informative, and taught me a lot of techniques that I had no knowledge of previously. Now I just have to find the patience in my sewing to actually utilize them. 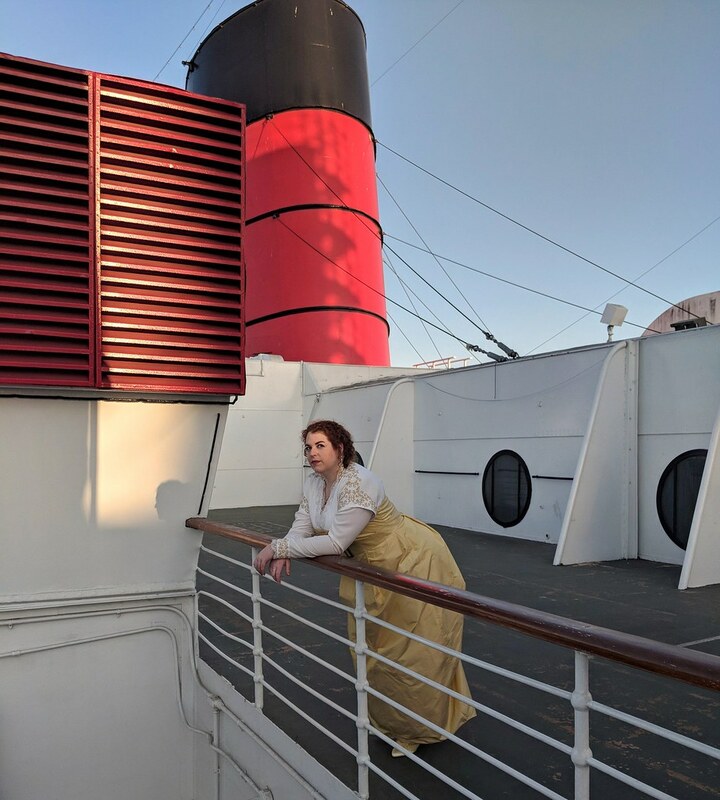 I wore my Victorian skating dress, which was very warm. 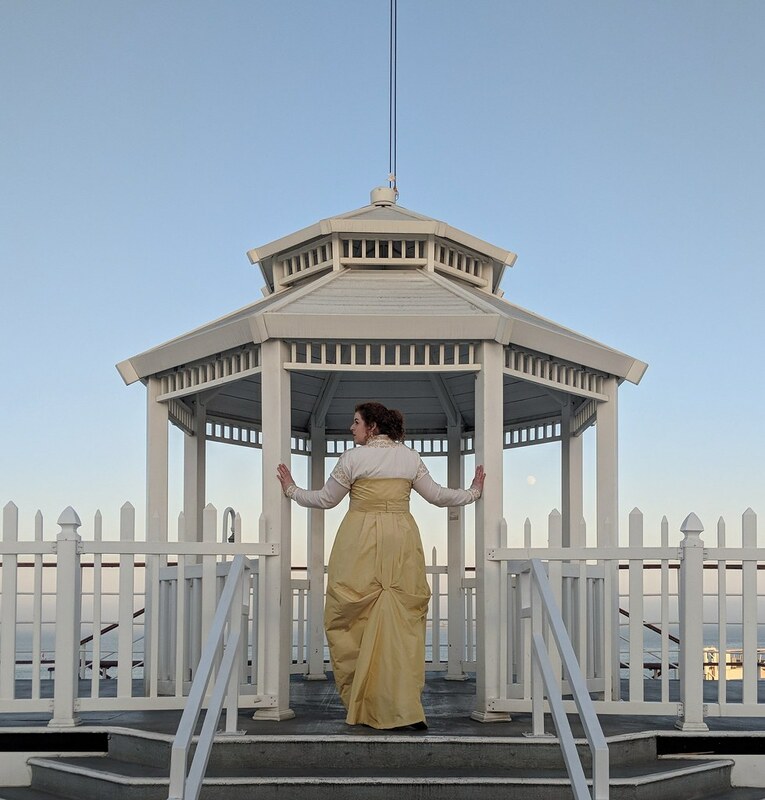 It made me really glad I hadn't attempted to pack my green wool winter bustle gown, which is even warmer! I'm going to have to try to remember not to bring winter-wear to CoCo, even if it is air conditioned. Too bad, since I think winter-wear is actually my favorite. As usual, it seemed like there wasn't enough time to get ready for the gala (why don't I ever learn?!). 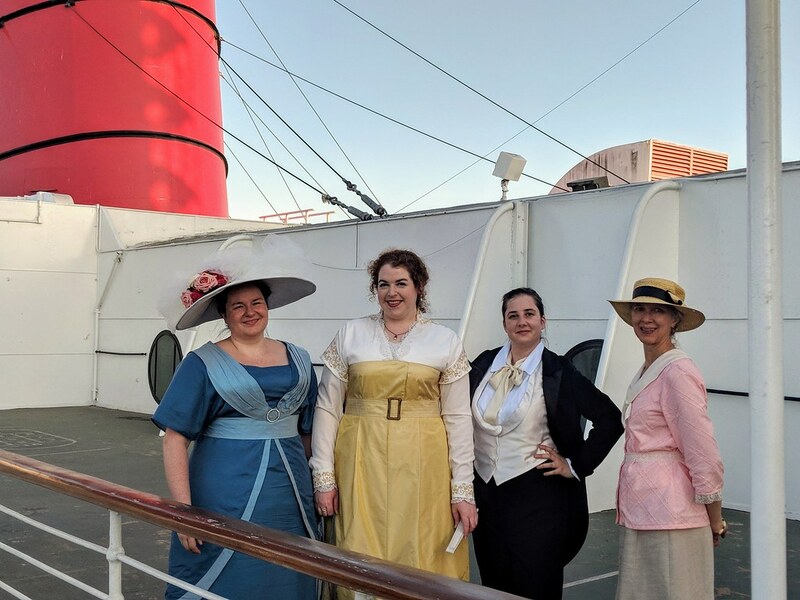 And like I vaguely remember last year, the gala red carpet line was ginormous, so we had to walk outside to get to the picture area, where our dinner group had planned to meet up. Too bad, as I would have liked walking the red carpet with my giant train. (Also, trying to round up 25 costumers at a gala red carpet line for dinner is like herding cats.) We did make it over to Maggianos, though, which was as tasty as usual. And I didn't spill anything, which was good, since I didn't have time to take pictures before dinner! I liked that everyone seemed to be hanging out in the hallway/CoCo lobby area instead of in the ballroom, since it's always so crowded and loud in there. And I actually put my train down a couple times (though really only if someone was taking a picture). I spent way too much time on that train to let it get dirty or stepped on! 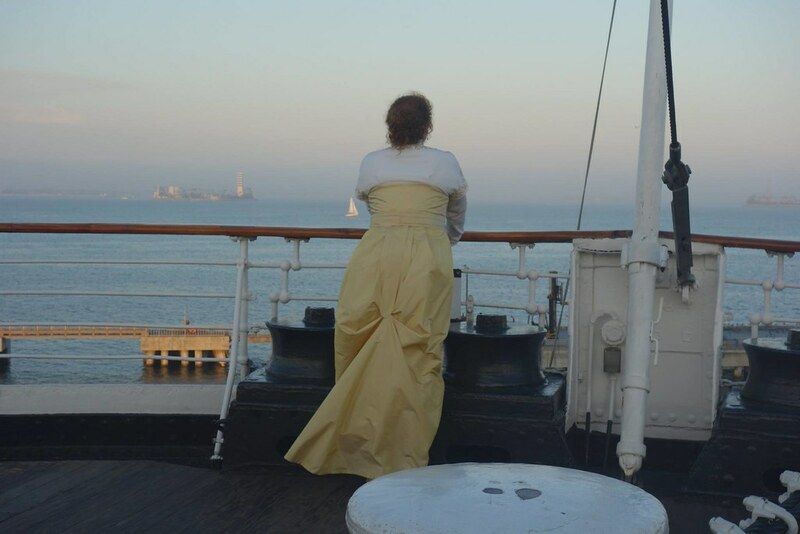 Overall, I really enjoyed wearing my gala gown this year. I need to figure out what else I can (safely) wear it for! 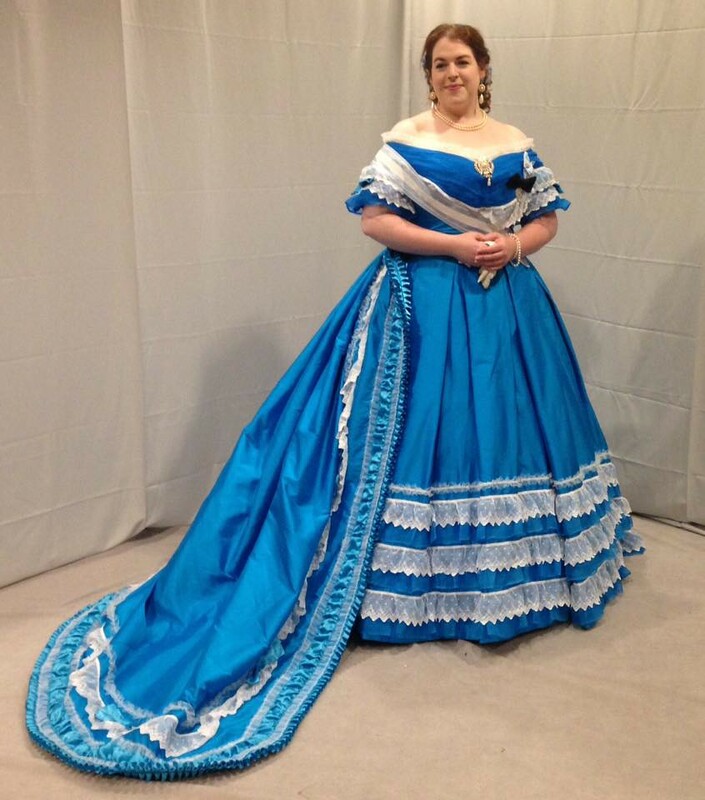 And now, picture spam of the finished dress! 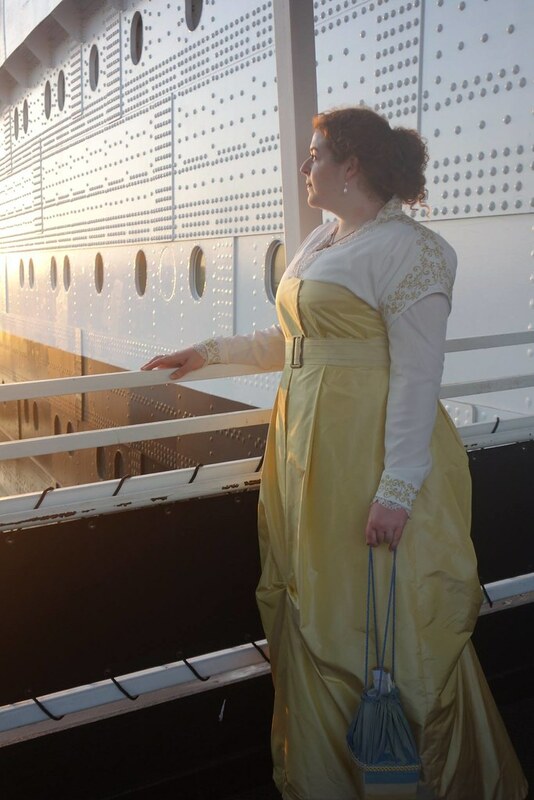 I wore my new Laughing Moon pattern-test pelisse on Sunday. 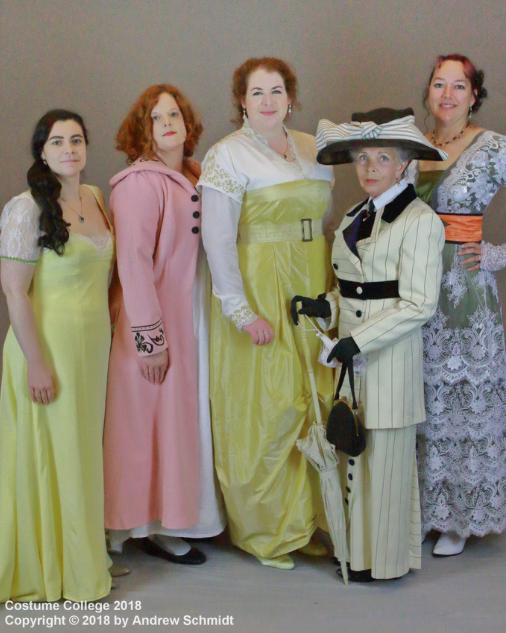 (PS, with the new wallpaper, the hallway past the photo studio makes for great daytime photos!) I hit the Bargain Bazaar in the morning, and found a couple gems - namely, 6-7 yards of dark navy wool, and an antique bodice! Not sure how I managed either of those, since there were at least 30 people who were ahead of me in line. No patterns this year, though, which is a little bummer, but I think I also got a couple trims, too. 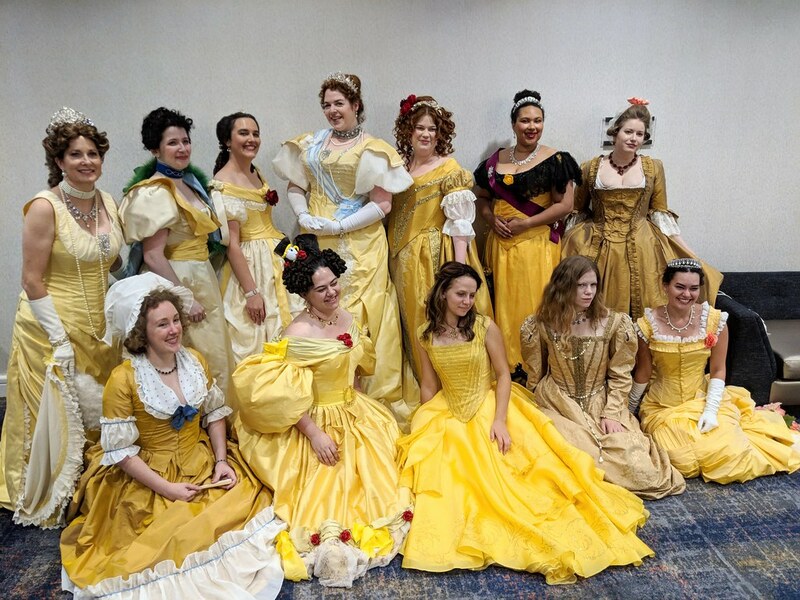 The only classes I remember taking on Sunday were Cynthia and Cathy's corset binding class, and Jenny-Rose's hair class, both of which were great. On Monday, I took the bus to the fabric district, and bought way too much silk, especially considering I had bought some on Thursday. 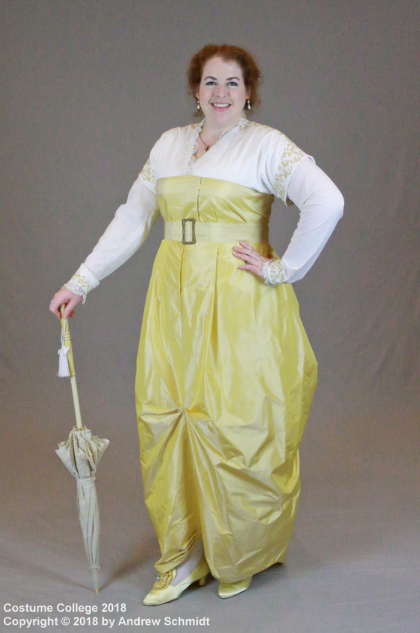 But on Sunday, they did have the goldenrod taffeta I was looking for Thurs, so now I have both. 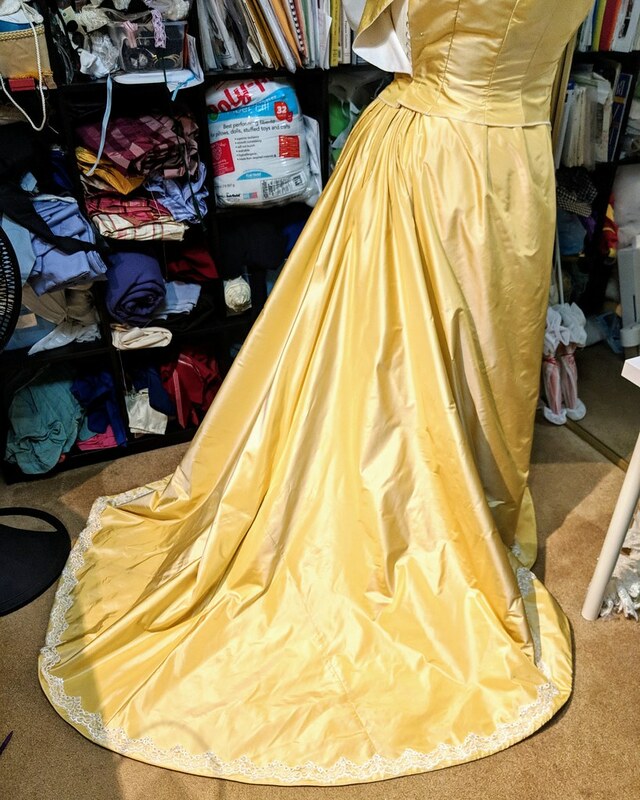 Of course, it turns out I'm doing my gala gown out of the butter yellow anyway - oh well, I guess I'll have beautiful fabric for a future project! Wow! I actually finished all my recapping! 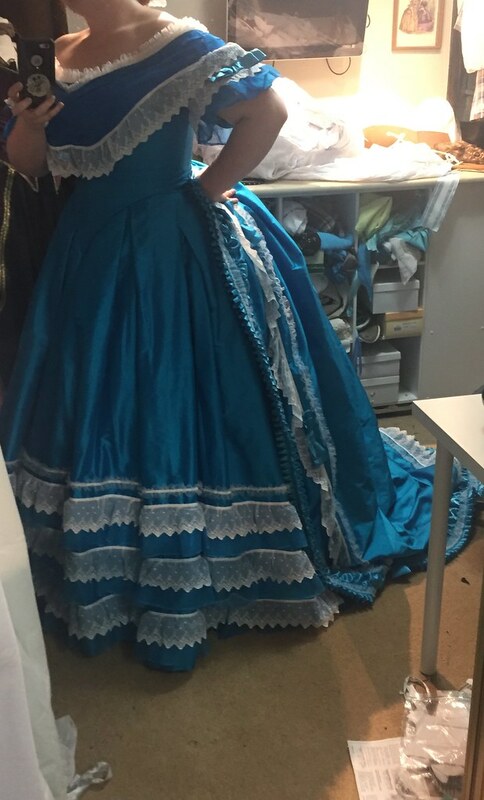 I tried on the turquoise gala gown with everything (except jewelry) yesterday for the first time, and I am so in love with it. Like, I was so happy, I felt like I could cry. I'm pretty sure that's what brides feel like. 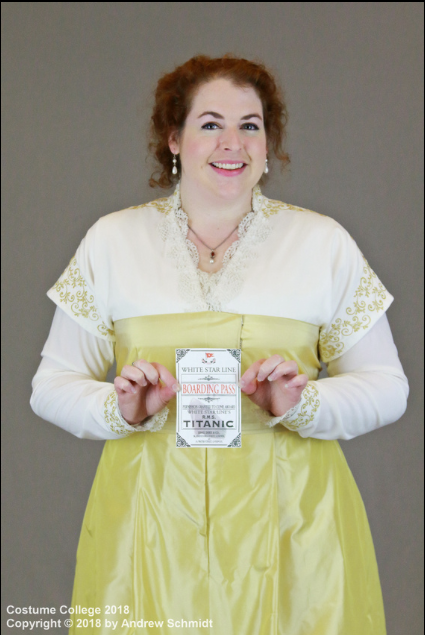 And somehow, it fit even better than when I wore it in Port Townsend. 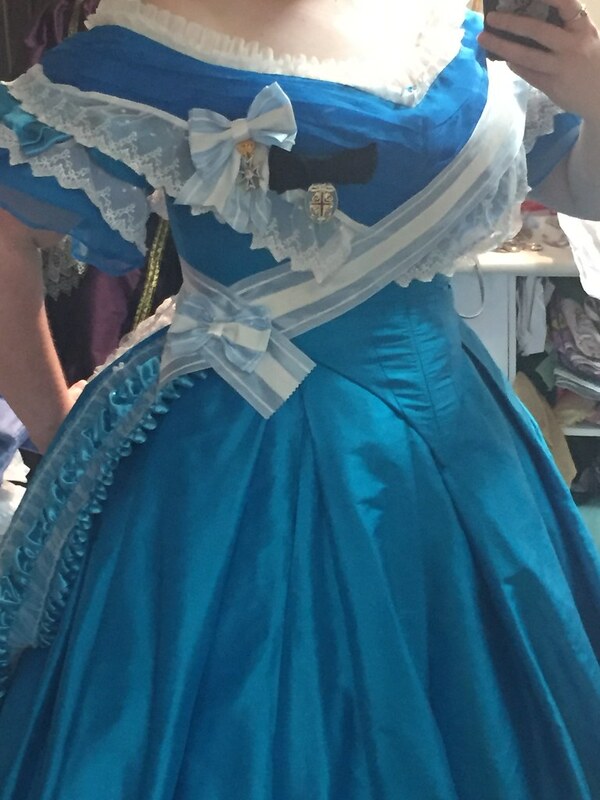 So anyway, I marked where the hooks and eyes on the train waist needed to go, and how the sash needed to go together. 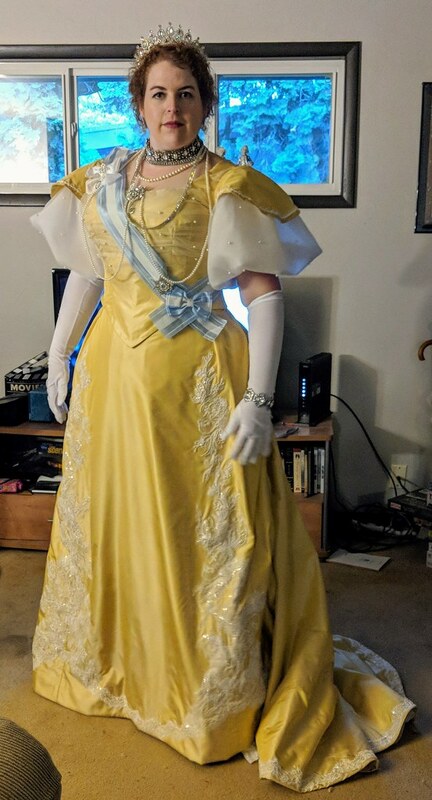 I think I may need to pin the sash to my dress at the shoulder so that I don't adjust it all the time, but at least it looks right. And I took a couple of pictures, which was very difficult since I don't at all fit in the mirror. 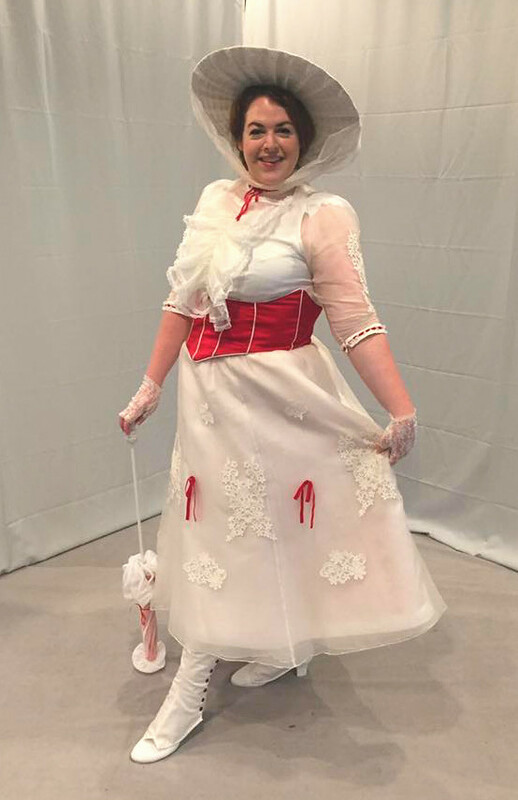 Once I took it off, I finished the waistband and the sash, which means all my CoCo sewing is done! 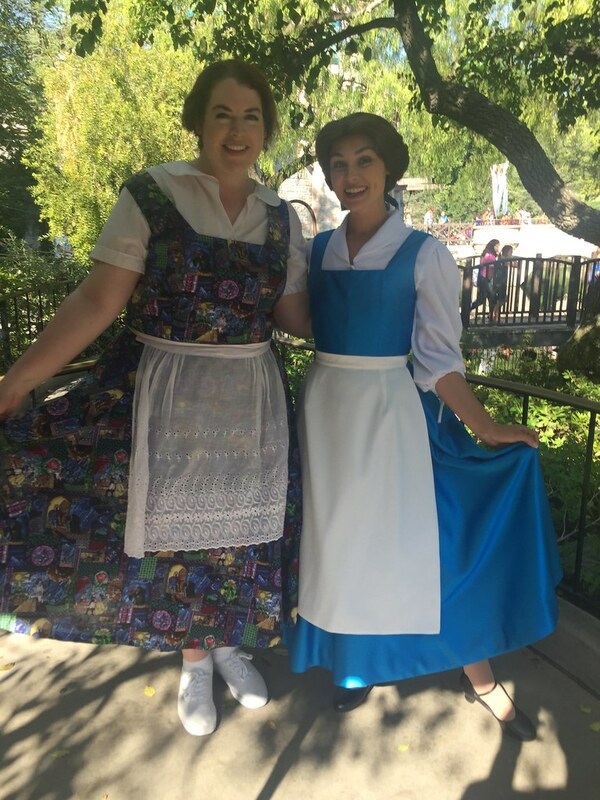 That said, I also spent a little time last night figuring out what pattern I wanted to use (and what alterations I wanted to make to the pattern) for a new Belle-inspired dress made of Beauty and the Beast stained glass cotton to wear to Disney. So hopefully I will have time to throw that together. It should be relatively easy (famous last words). I also finished my handout for the class I'm teaching. I still have to cut out all the pieces I'm providing, and buy the supplies I need for the classes I'm taking, too, which will hopefully happen tomorrow. After a super productive Friday, I had no time at all for sewing yesterday, and didn't get much done today, either. 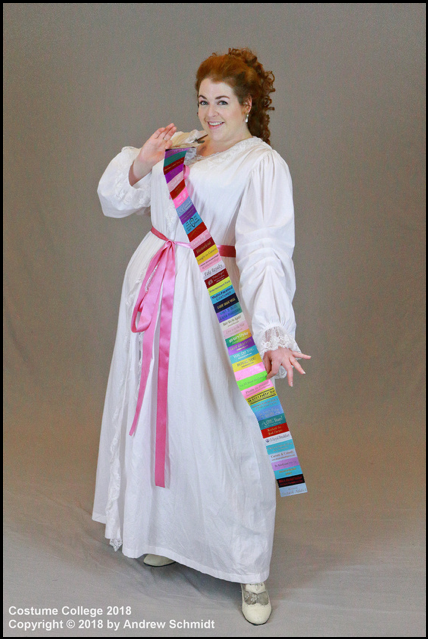 I painted my order ribbon with two more narrow stripes down the sides (which is how it looks in the portrait, but not how the Order of Charles III ribbon actually is, so I decided to add to the wide stripe I had already painted). And while that was drying, I finished painting the medals. Such tiny details - I wish I had smaller brushes, because while I think I got the Starry Cross medal pretty darn close, I couldn't put much detail on the Charles III medal. 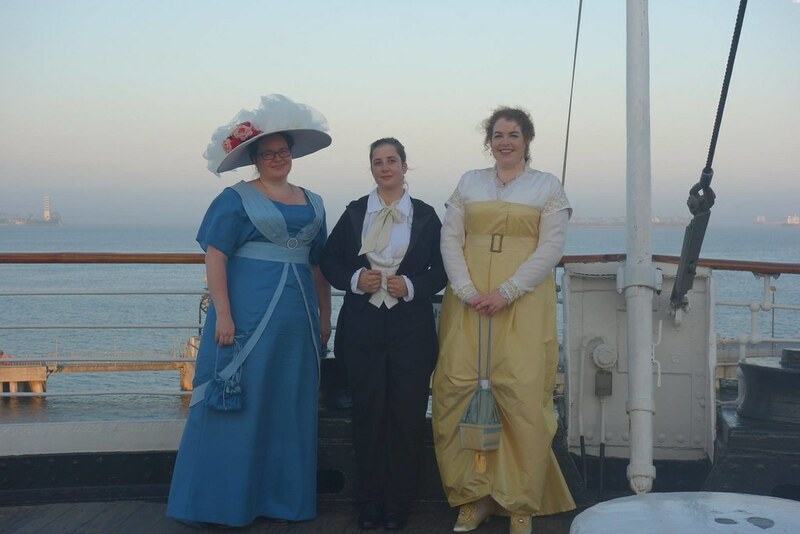 And then I made the bow tops for them, and I put pin backs on so that they would be easily removable. 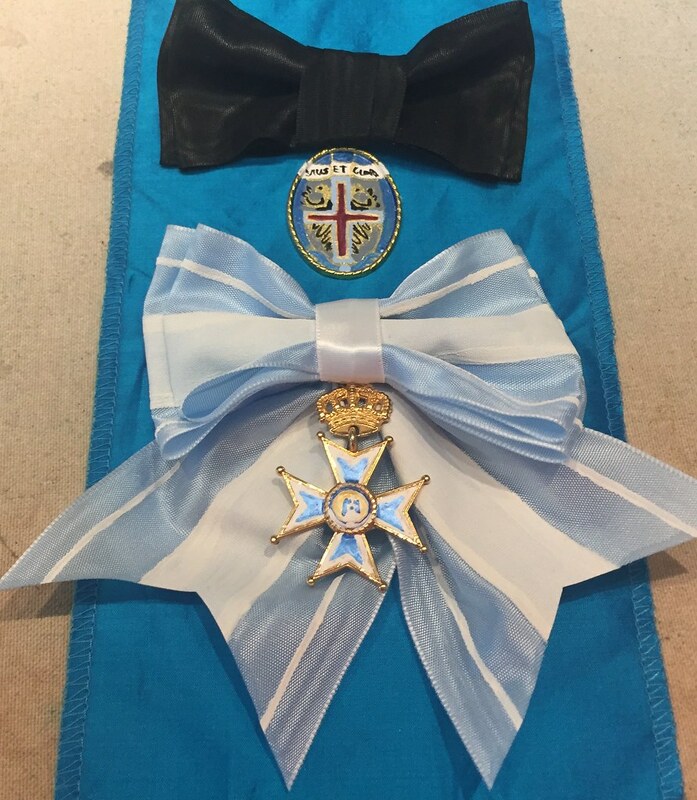 In the picture, the top one is the Order of the Starry Cross, which started as a cabochon backing for a pendant, an the bottom is the Order of Charles III, which was a blank gold medal. 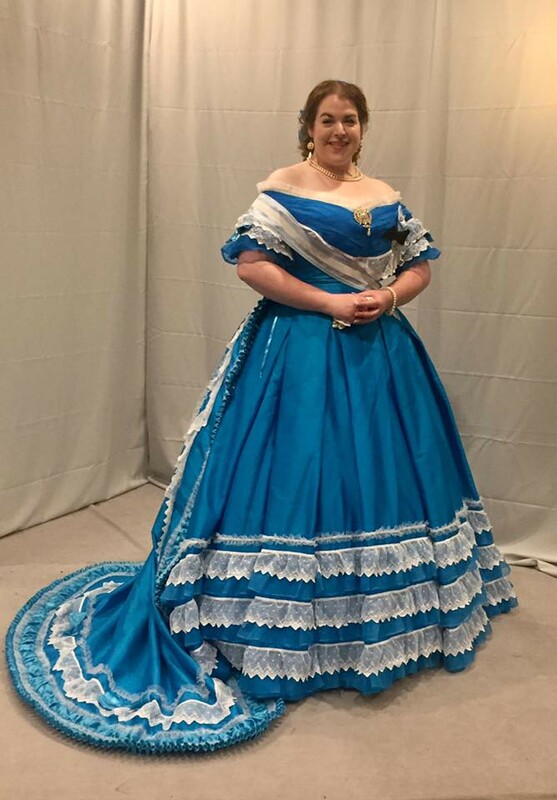 I was hoping to be able to try on all the gala stuff, so that I could figure out the sash length and get the hooks and eyes on the train waist, but I ran out of time before rehearsal, so that will have to wait till Tuesday. 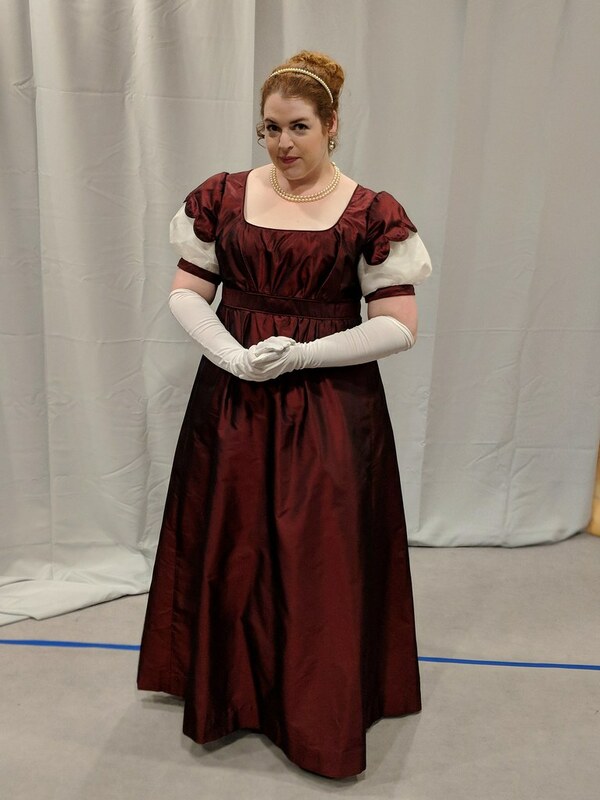 I also dug out my extant 1890s bodice with the huge sleeves, which I will be bringing to show my class, and washed the organdy so that I can cut out all the pieces for the students. 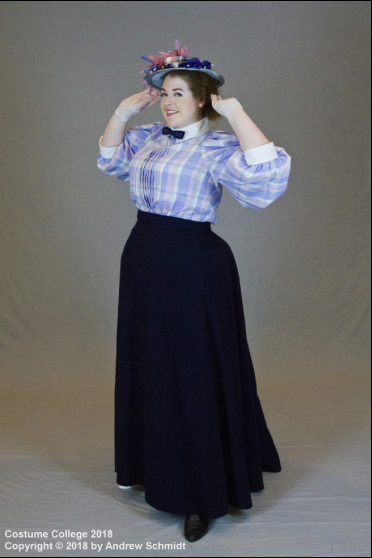 1) We're making an 1890s sleeve as part of my class. 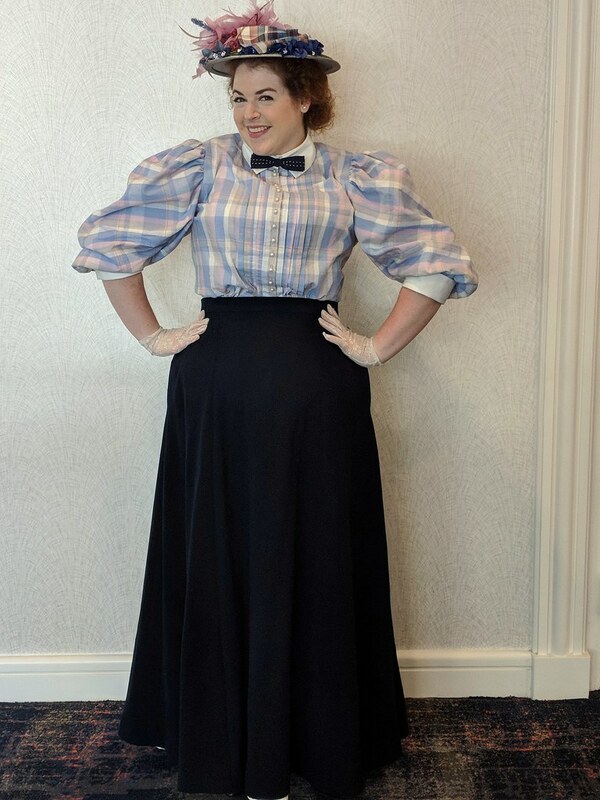 There are tons of 1890s sleeve shapes out there - should I do an 1890s upper sleeve puff, which would work either for an evening sleeve or paired with a lower sleeve, or should I do a leg-of-mutton sleeve? I'm leaning towards the former because they require less fabric. 2) Also, because there are so many sleeve shapes out there, I was thinking of providing drawings of a couple shapes in my handout, and not providing a huge paper pattern (especially since I will be doing all the fabric cutting ahead of time). Is this fairly normal for classes? I can't remember. I worked on CoCo stuff for the better part of 12 hours today. I'm feeling pretty tired, but at least I got a lot done! 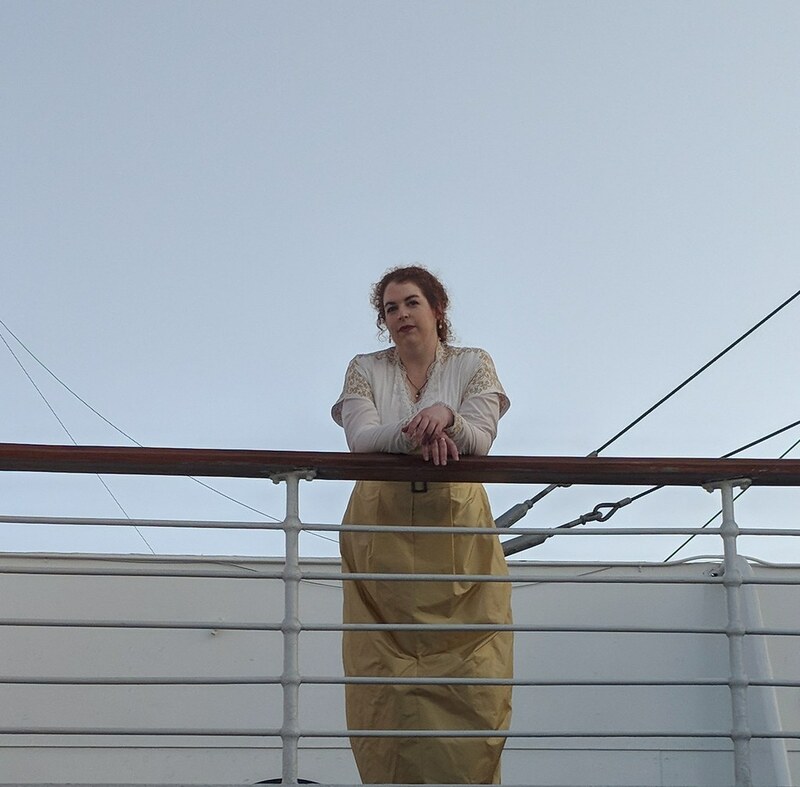 Elizabeth Swann is completely done. 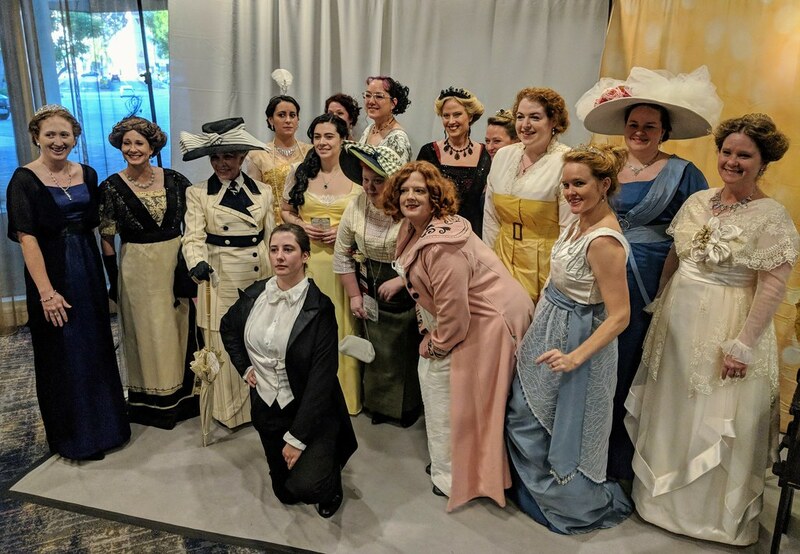 Unfortunately, I found out that no one else in the Keira Knopely group actually managed to make anything, so I'm bummed about that, and I guess I'll just be completely random at the Social. I'll probably also use it for my Halloween costume, though, and I am happy with how it turned out, so I guess not all is lost. Anyway, I started making the chemise for it yesterday afternoon, using McCalls 6817 as a base, but narrowing the skirt by about 28" at the hem. I had to piece the shoulder strap, because I was literally 1.5" short of fabric. (Of course, after I put it on, I realized it was 1.5" too long at the hem. And I lived dangerously, and didn't make a mockup. 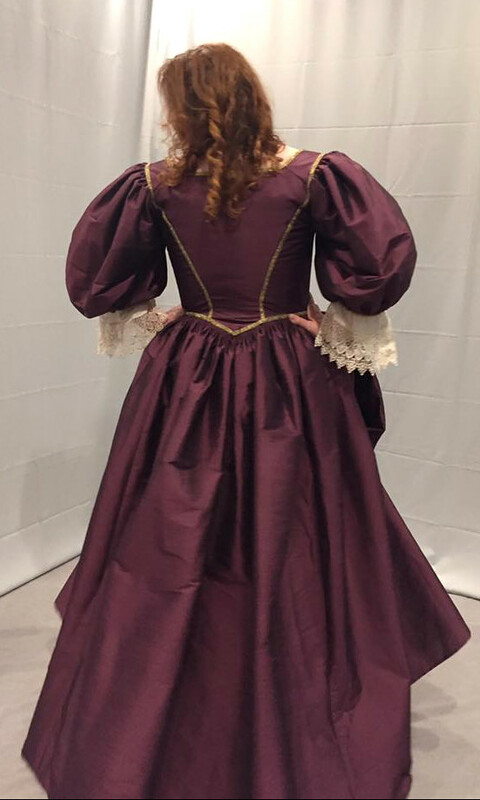 I wound up taking it in quite a bit at the side seam, and a little at the CB, and I changed the shape of the princess seams over the bust, since I am wearing it over my stays. But other than that, it went together quite smoothly. I'm not doing sleeves (at least, not yet), because I don't want the extra heat, so I have left the armseyes unfinished for now. 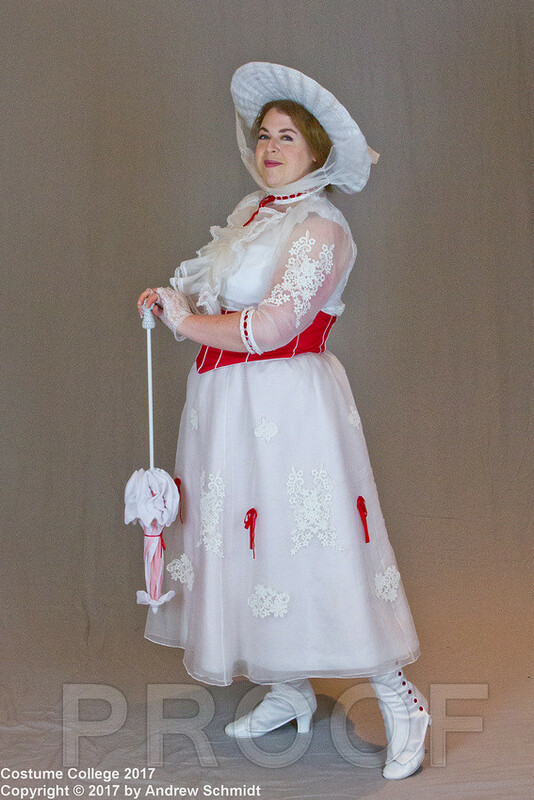 I added a drawstring at the neckline, and the front spiral laces with eyelets going down to just above the hip. 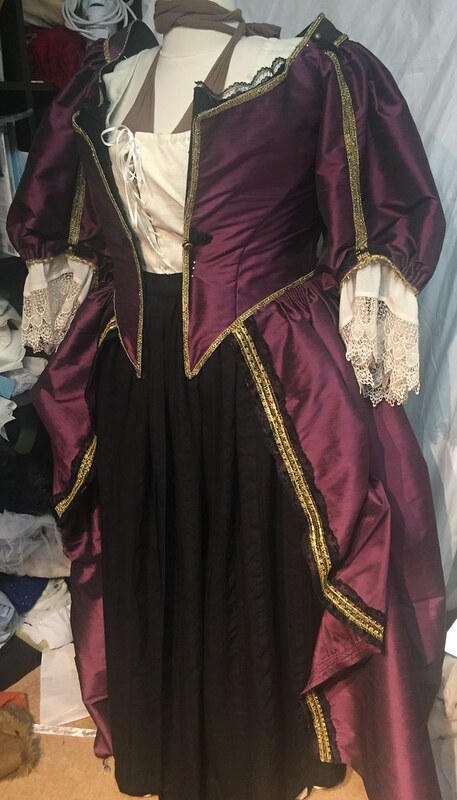 I also finished the hook and eye at the waist of the skirt, and yesterday, I finished all the frogs/buttons/pickups on the overgown. And last night, I did one coat on my shoes, then I did the other coat and the finisher today, and put in the buckles. But that wasn't all I did today! I also made my earrings for the gala gown, and the headpiece. 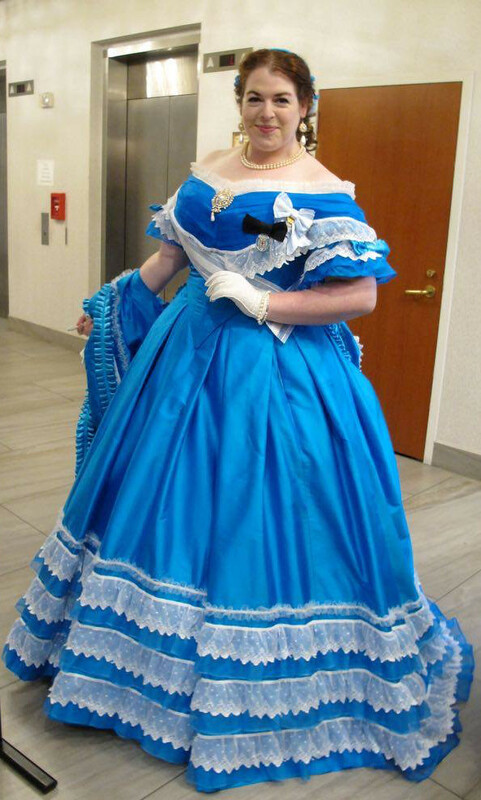 For the headpiece, I took a circle of millinery wire, wrapped it in white velvet ribbon, and then dyed it turquoise. 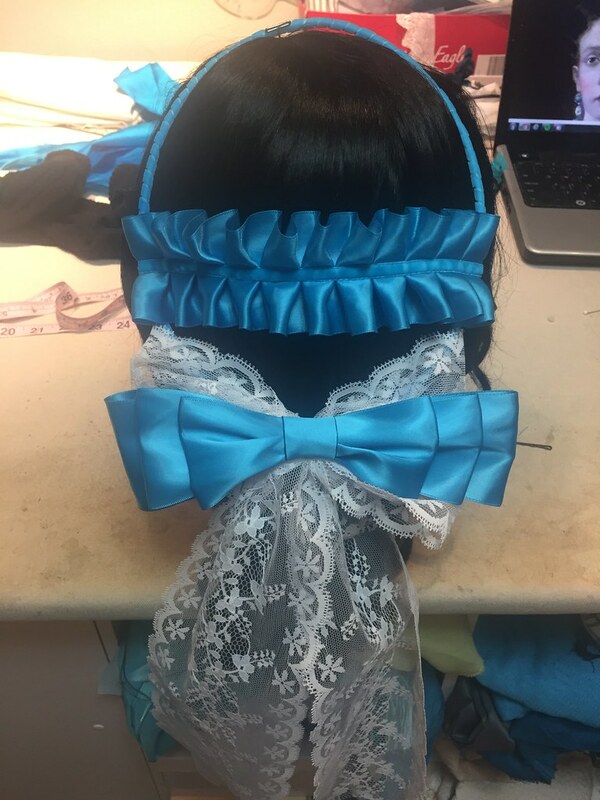 Then I added a huge triple bow of the turquoise ribbon, and a lace bow with hanging tails. 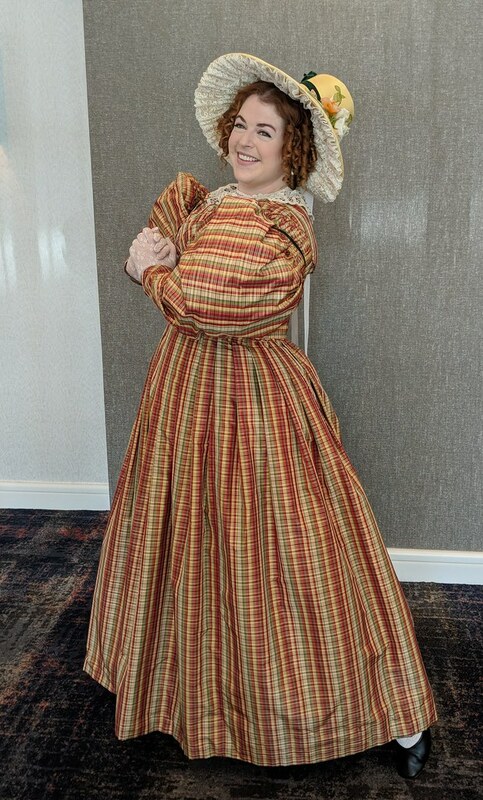 It needed more, though, and many of those headpieces seem to have a piece that runs across the top of the bun or curls, so I took the leftover pleated ribbon from the train, and it fit perfectly! I also dyed some ribbon millinery flowers, which I will either fix onto combs or barrettes, or I will just twist into my hair, since they are on wires. 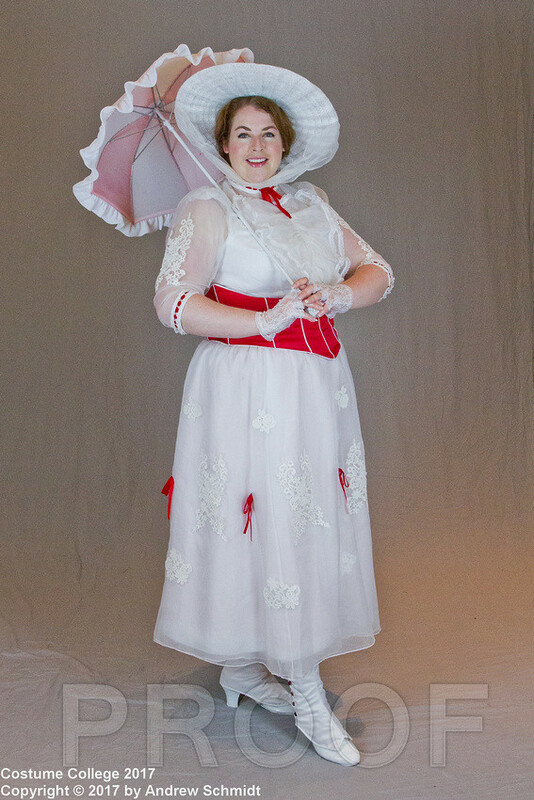 Oh, and I tried on Mary Poppins, and despite the weight loss, I don't need to move any hooks and eyes. I'm not sure if that's a good thing or a bad thing... 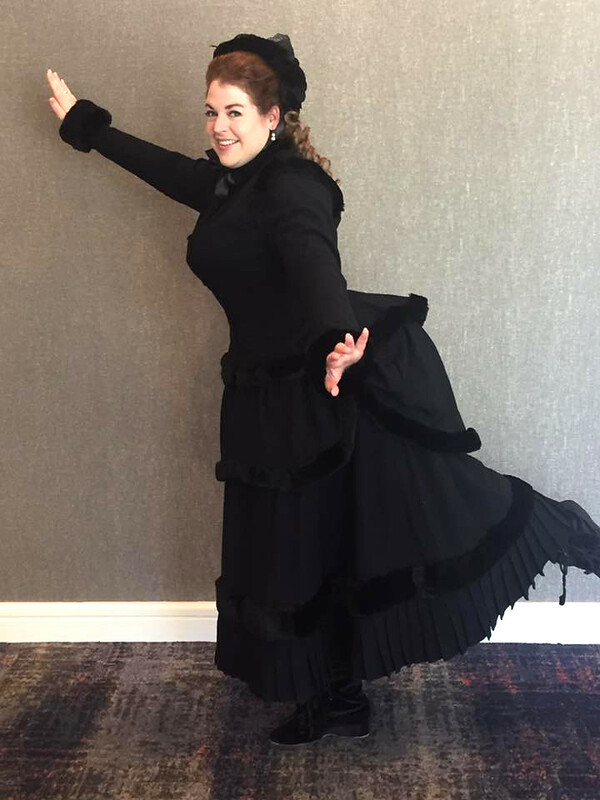 I'm thinking about possibly wearing my skating bustle on Friday to teach, though, and doing Mary Poppins and the pelisse on Sat or Sun. I still haven't decided what to wear when, but I should probably get on that. I think that's it, but I'm sure I'll find other things that need doing. However, I'm definitely feeling more relaxed now. Apparently, I've been sewing and not posting. Whoops. 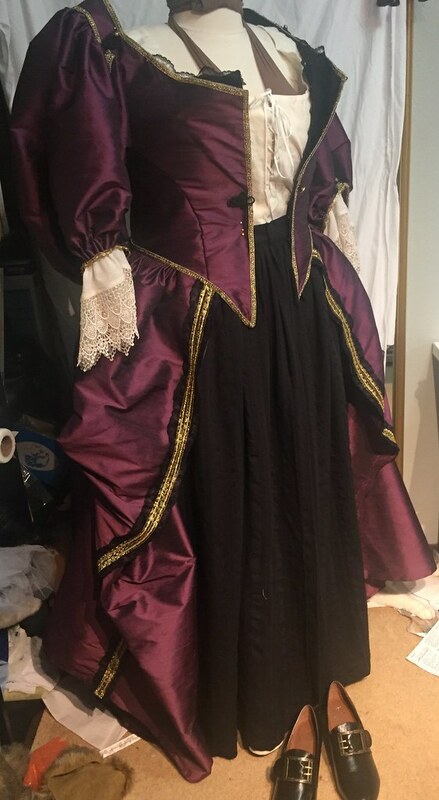 Anyway, the Elizabeth Swann gown is nearing completion. 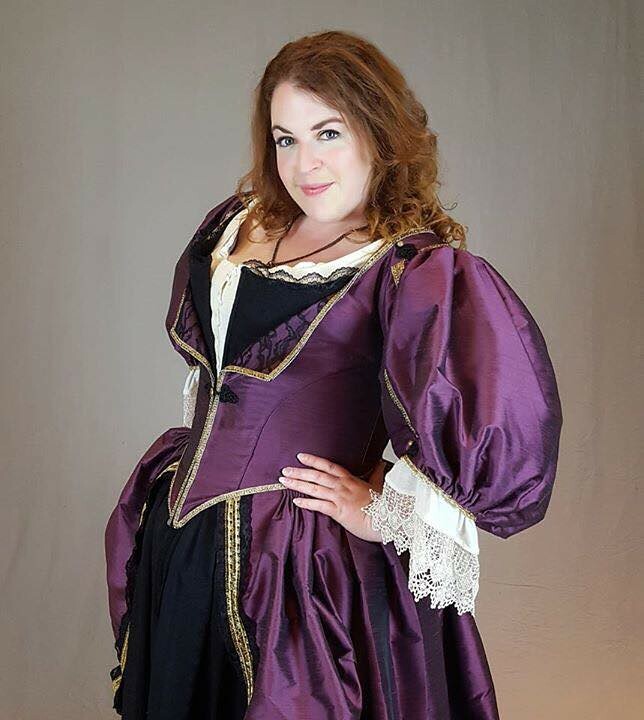 It's been going much slower than I hoped, because I forgot just how much hand-sewing is required of 17th century bodices. 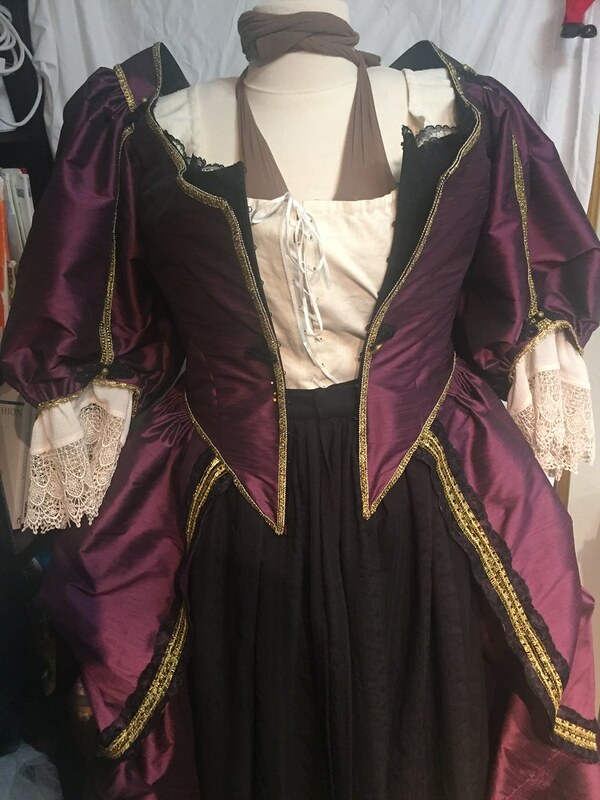 Anyway, at this point, I have to finish attaching the cartridge-pleated skirt to the bodice, and then I have to hem the skirt and the underskirt. 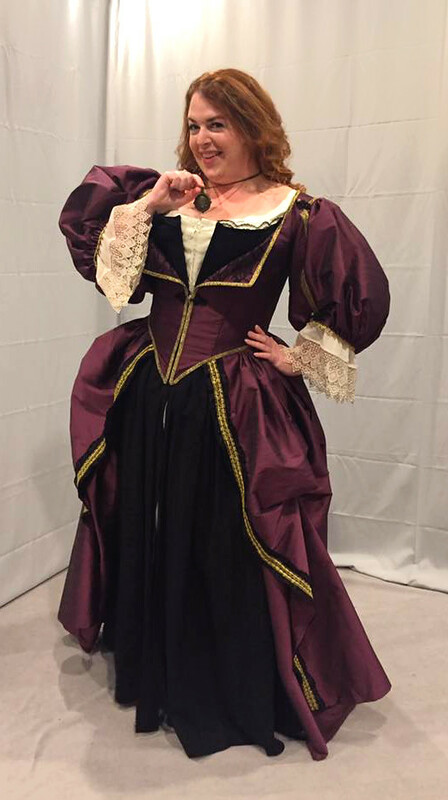 When the frogs I ordered get here, those and a few decorative buttons will be added to the bodice as well. 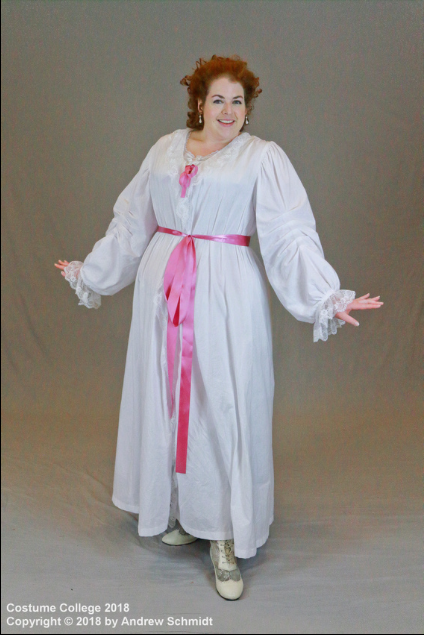 Until they arrive, though, I'll be moving on to the chemise. I'm not worried about doing this one accurately to the movie, since a) I am wearing it over my stays and a regular chemise, since I didn't feel like boning the whole bodice, and b) the only parts of it that are going to show are possibly the neckline, a tiny strip of the bodice front that can be seen through the bodice h&e closure, and the skirt, since the other skirts are open down the front. So actually, I think I may save myself some time and some heat, and just make it sleeveless! I can always add the sleeves in later if I decide to. 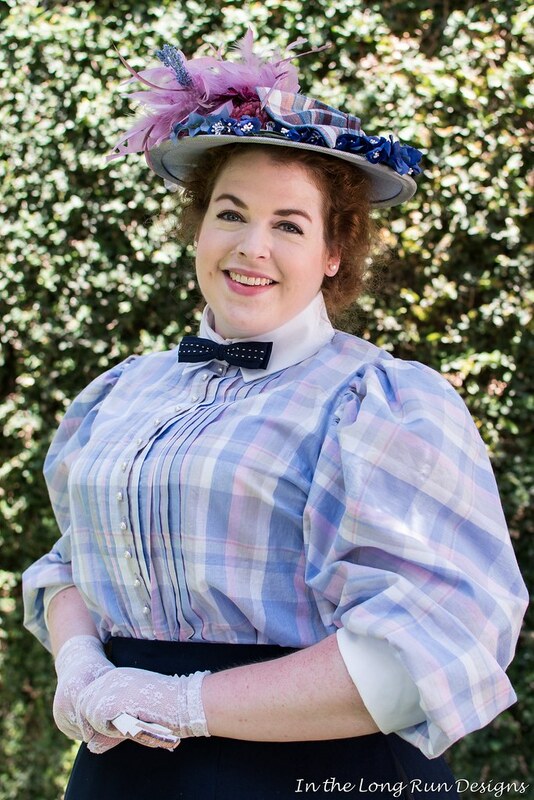 Mary Poppins - try on and possibly move h&e at waist on waist cincher and skirt. 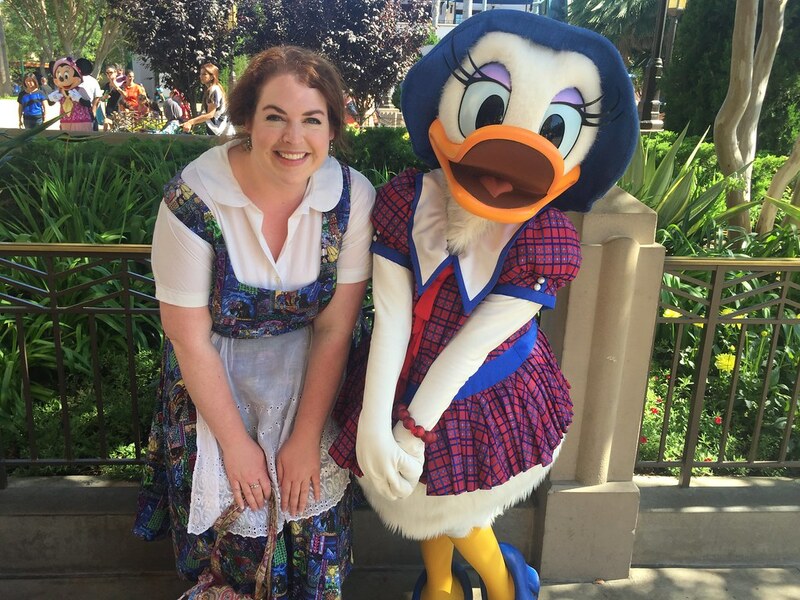 If I have time, I'd also like to make a new skirt or dress for Disneyland. And today, I have to make a skirt for an etsy order. I spent all day today sewing - in fact, it's the first day I haven't had to leave the house in a really long time, which was wonderful. 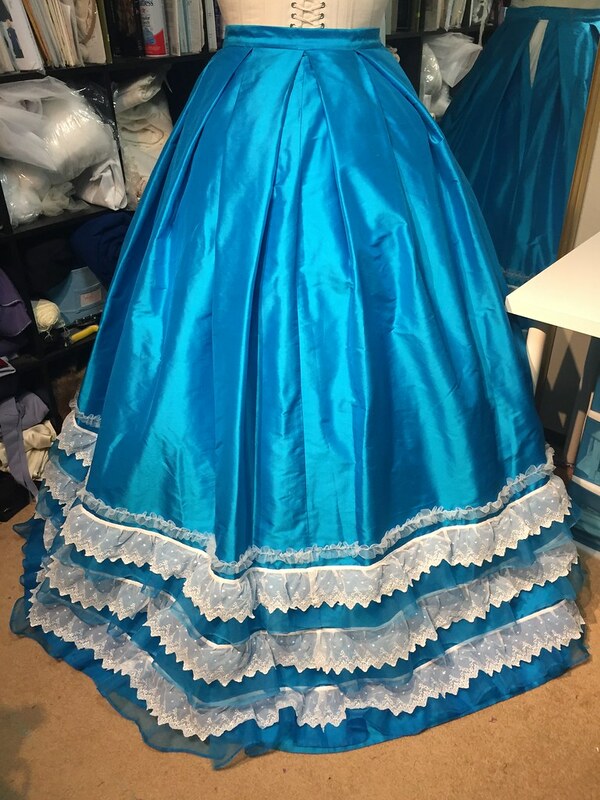 I worked on the trimming of the ballgown skirt all day, and naturally, it took way longer than I thought. But it's basically done - the only thing it's lacking is narrow velvet ribbon going down the center of the ruched net trim. I clearly didn't think that one out ahead of time, but it is now on order, and should be here by next Monday. 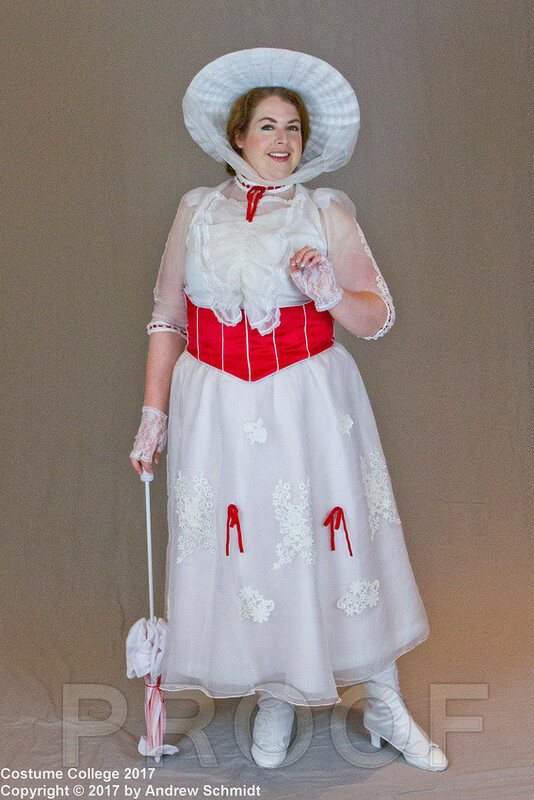 I also probably ought to sew together all the joins in my organza and my lace, since I haven't done that yet. 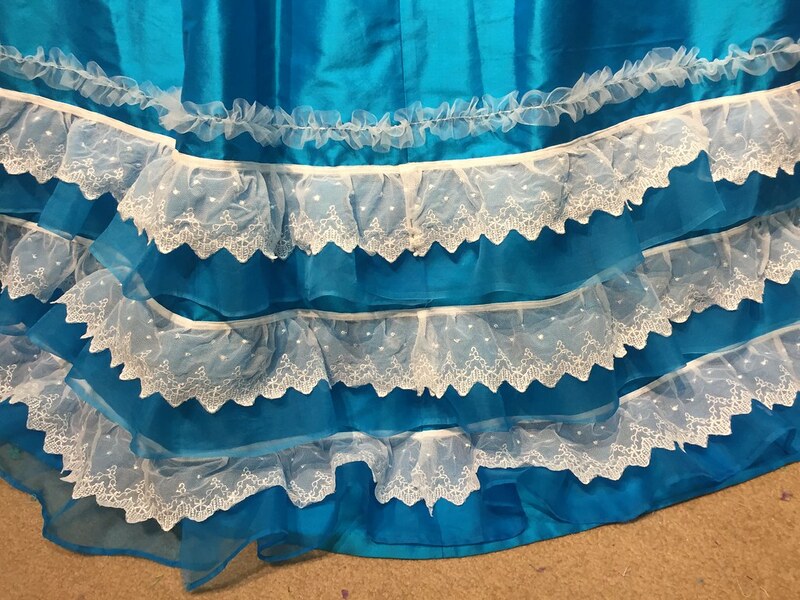 It's trimmed with three rows of 5" wide gathered strips of dyed turquoise silk organza, layered with embroidered net lace from Joanns, and above that is a row of gathered net (very soft Casa collection stuff from Joanns). The net lace definitely looks bolder than I'd like (and looks even bolder in the pictures than in real life), but I'm sure once everything else has trim, it won't feel so garish. I have to admit, there's a little bit of regret adding the trim, since it was such an eye-catching color just plain. 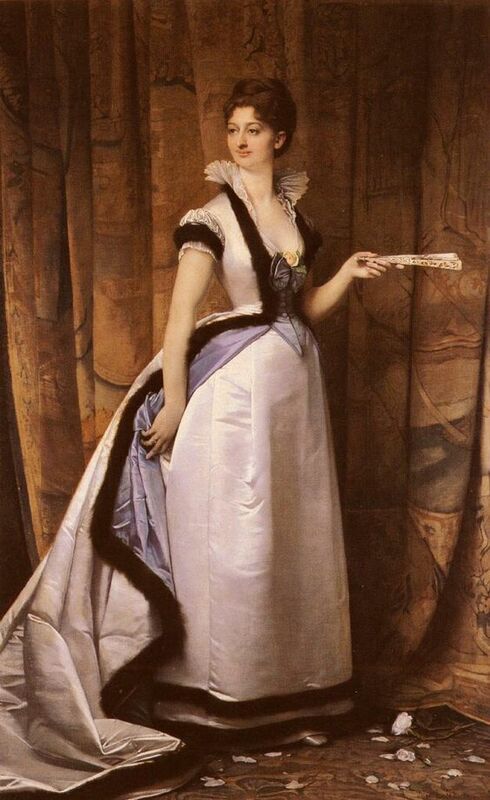 But I'm determined to replicate the portrait. Anyway, I thought it would be simple, but 1) my ruffler foot broke, and I spent an hour calling around to see if anyone local sold them (no), and then trying to fix it (which I did! ); then 2) I didn't have enough organza already dyed and cut into strips, so I had to cut two additional strips, which then didn't have a selvage edge like the others, dye them, put a tiny narrow hem on them, and then repeat all the steps I had already already done with gathering and attaching all the rest of the organza; and 3) I likewise prepped 5 strips of the ruched net, and wound up needing six. 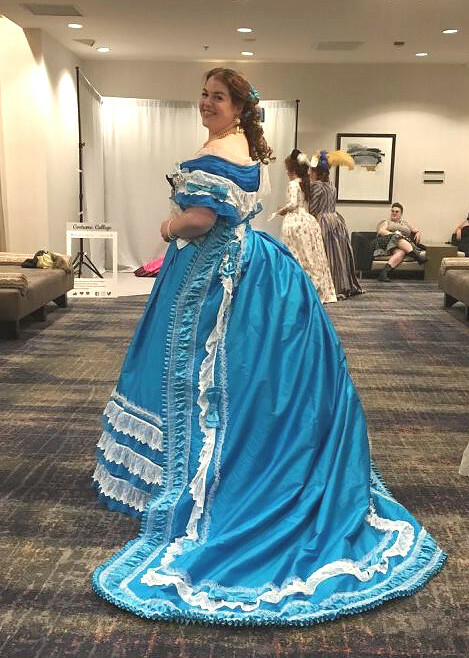 So I'm pretty sure I worked from about noon-10:45, with many two 1-hour breaks... My back is really sore from all that sewing now, but then again, I won't have another chance to sew till Friday, so I guess it makes up for it. I got my CoCo Limited classes last week, and now I'm trying to figure out if I really want to do all of them. I actually got four, plus the fabric district tour (which I always do, because it's easier to shop on Monday and head directly to LAX). 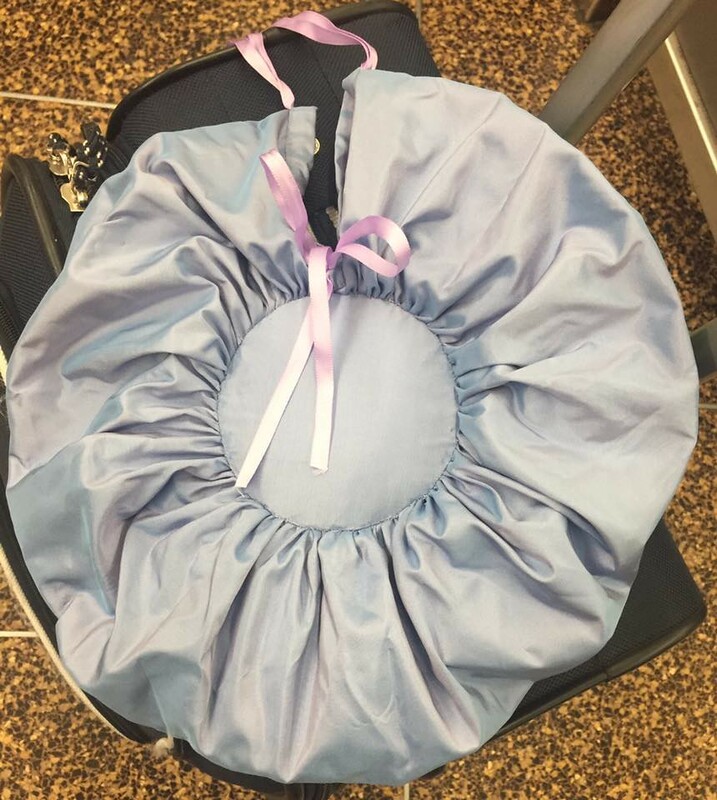 I got Tailor's Canvas and Reticulous Circular Handbags, both of which I know I want to do. 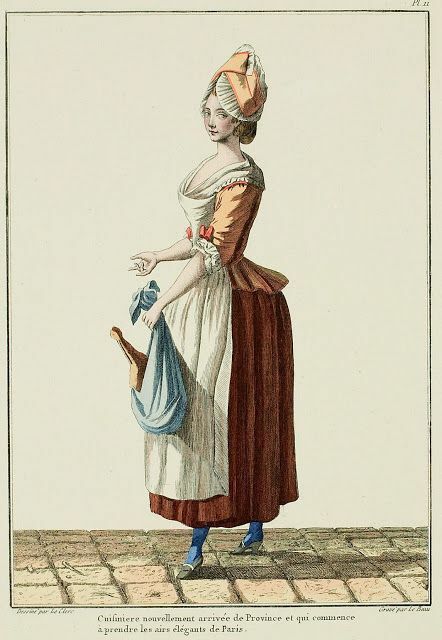 But I also got the 18th c Riding Habit class on Thurs, and the Combination Underwear class on Sun, both of which I'm not sure about. The Riding Habit class is really expensive ($60!). It would mean I'd have to rush up from Anaheim (the class is at 1pm) and not do any museums or shopping on the way. 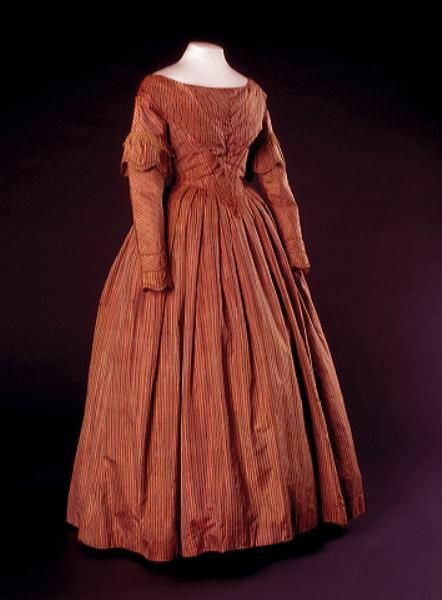 I'm not in love with the comfort of my 18th c stays, so fitting anything to them seems counter-productive. 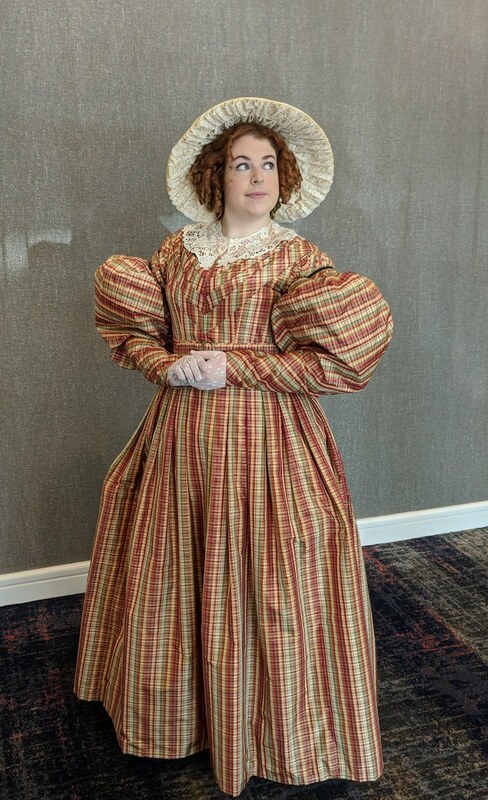 I also haven't done much 18th c lately, since I've found I love Victorian way more, and I'm not totally in love with the shape of that pattern (it looks a little boring to me). So basically, I think I'm not going to do it, unless anyone here thinks it's one I shouldn't miss? 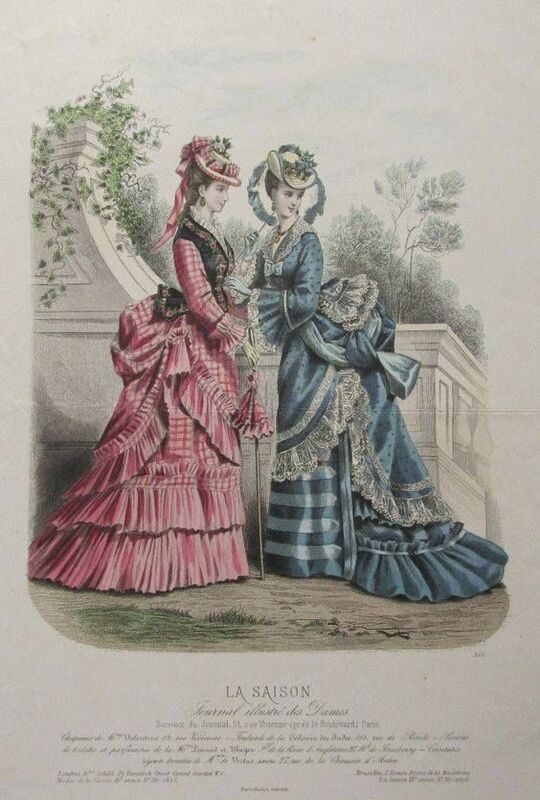 Just got the email - I'm teaching the 1830s Sleeve Supports vs 1890s Sleeve Construction class from 12-2pm on Friday. There are 14 spaces, and I hope you all attend! 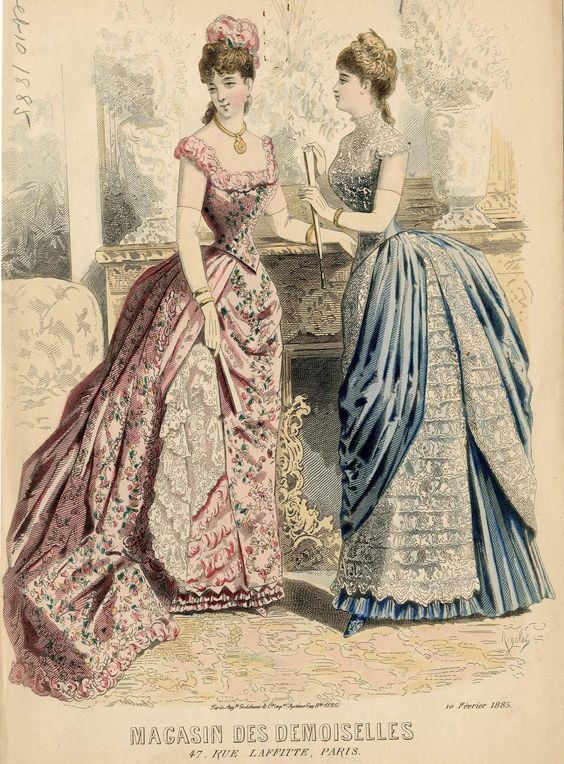 I'm determined to somehow bring my extant 1890s bodice with the giant sleeves to share with everyone, too, since it's such a good example. In other (sewing) news, I actually worked on my crewel embroidered pocket from way back at CoCo 2013 (I think?). I have picked it up exactly two other times since then, so this is a big step. I finished one flower and a bunch of stems while at rehearsal today, and I'm pretty sure that if I bring it to rehearsal for the rest of this week, I will finish all the embroidery. 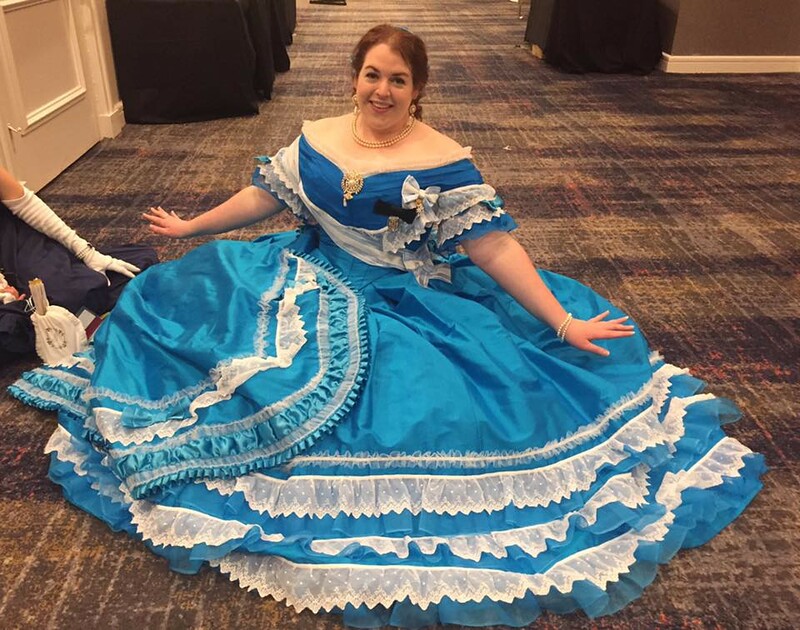 This also means I really need to get the giant turquoise dress or 1860s corset to a hand-sewable state by the time I finish the pocket, so I have something to do at rehearsal. This week is probably going to be quite busy, though, since my ex is still moving his stuff out, I have to get the couch moved out of the spare room so my new roommate can move in this weekend, and I have plans to get new tires and to hang out with two friends this week. And work, of course, since my parents flew home this evening. I really need to manage my time well! What should I teach at CoCo? -How to digitize embroidery using Brother PE design - This would be an hour-long limited class where I go over the basics of how to do point-by-point digitizing, and altering the shapes that come with PE design. I would have my laptop hooked up to the projector, and if people already have PE design, they could follow along on their own laptops. 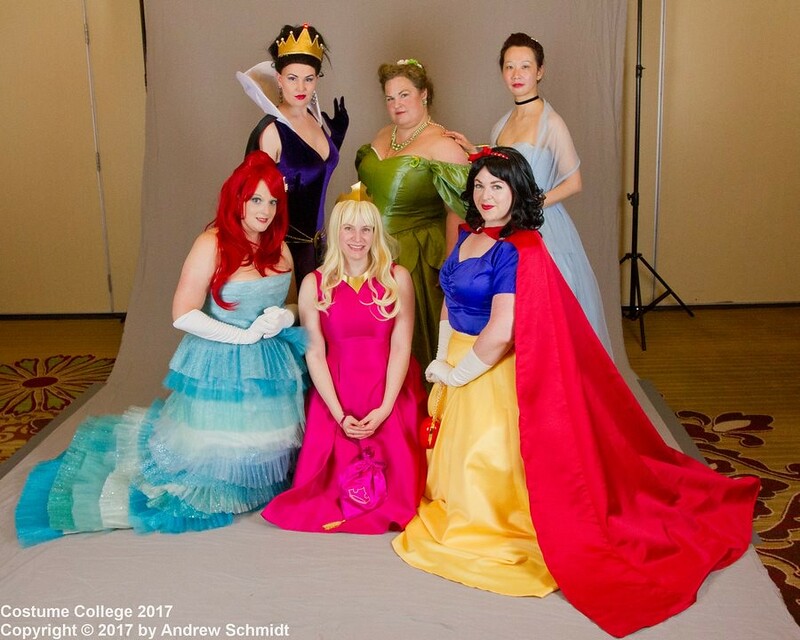 -Recreating Disney princesses - An unlimited class where I would go over tips, patterns to use, sources for hard-to-find materials, etc, so that other people could learn how to make exact reproduction Disney princess dresses. 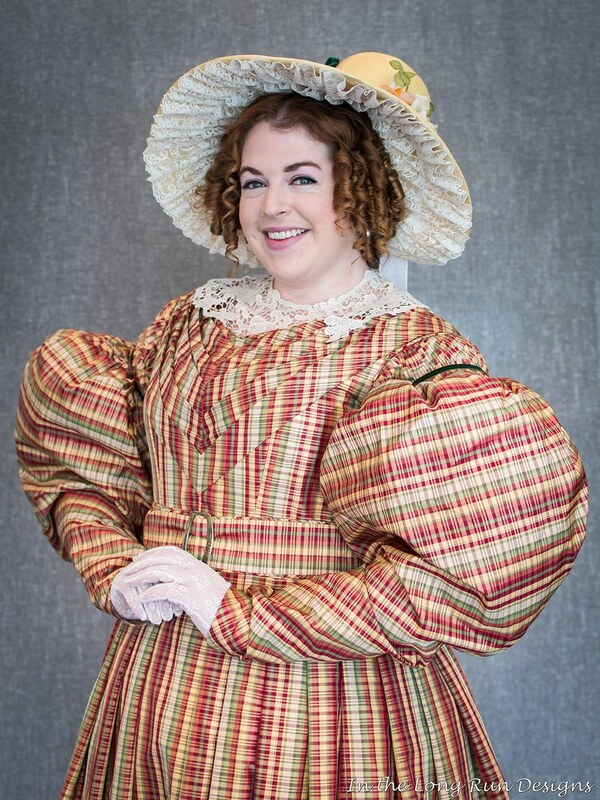 -Make an easy 18th c quilted petticoat - A limited 1-1.5 hour class on how to create a quick and dirty quilted petticoat out of matelasse or other pre-quilted fabric. 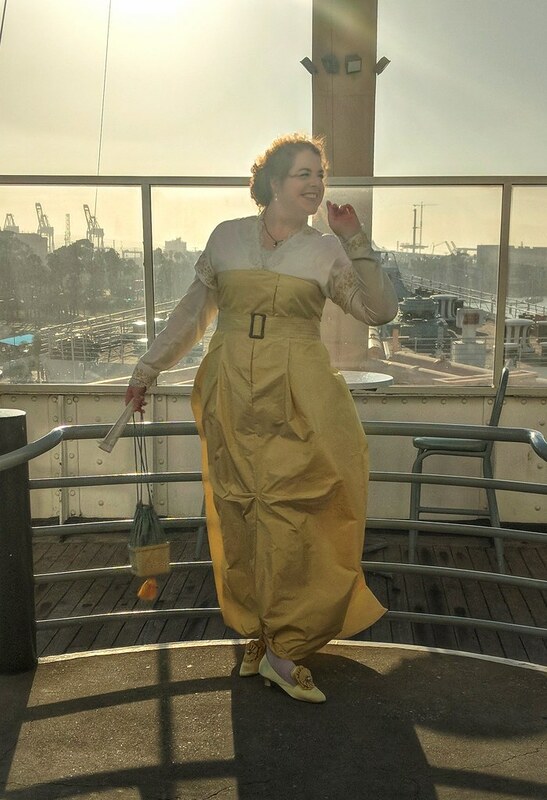 Oh, and in unrelated sewing news, I only had time for the Belle dress order yesterday, and because I went to see Star Wars after work today (finally! ), and had rehearsal, I managed to sew down half a piece of velvet ribbon to the lapel on my dickey. I should get more done tomorrow. Anyway, I dumped my stuff in my room, grabbed a muffin from the Concierge lounge, and scurried off to Luca's 19th C Silhouette class. 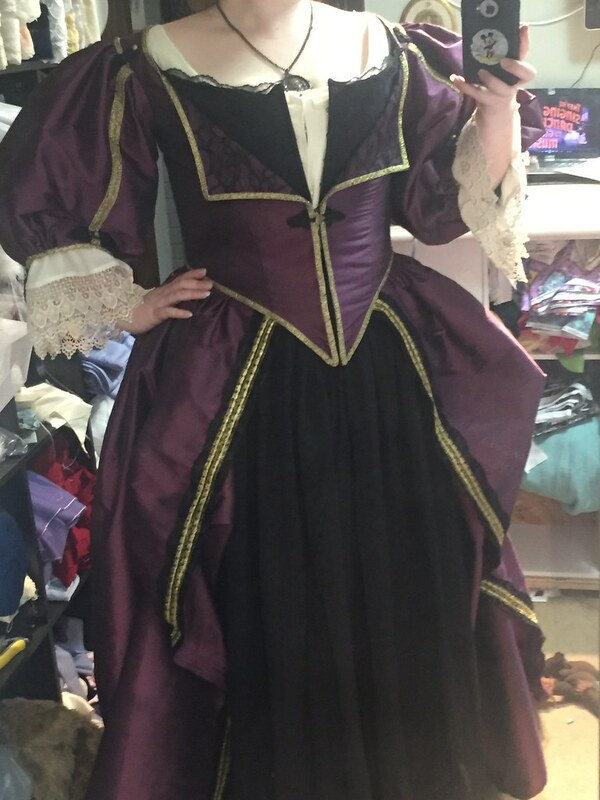 I now plan to make all my stuff with padding (after I make the proper corset, of course!). Next, I took Francis's Galliards dance class, which was very fun - I swear, between his class this year, and ashamanja_babu's dance class last year, I think I have more fun in the dance classes than in any other CoCo classes! I want more! 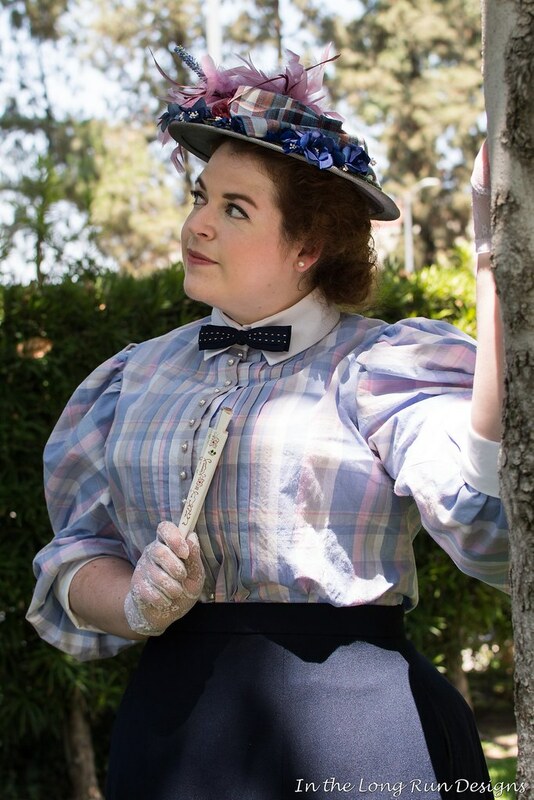 I also went to Laura's class on dating historical garments, which was very informative, and she helped me narrow down the dates on my new 1890s walking suit (probably mid-1890s, even though the sleeves aren't crazy huge, because it's not an outfit that's at the height of fashion, anyway). That was it for CoCo classes. 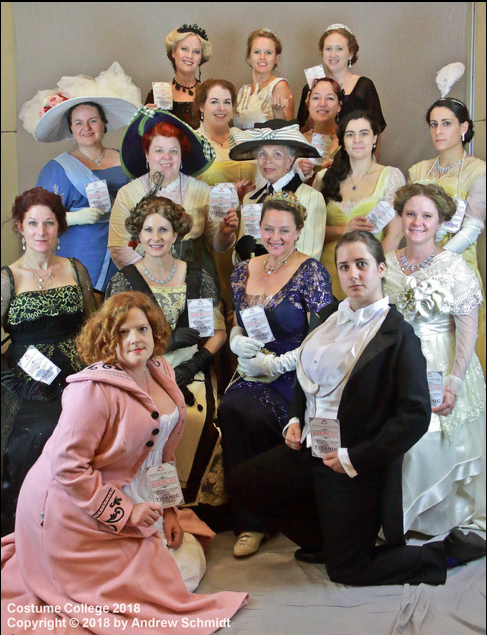 I did spend some of my other time on Sunday hanging out with Harry Potter friends, doing readings of the new play. We made it through the first act together, all playing multiple characters, and it was awesome! I also re-learned how to play Whist. :) But eventually, it got too late, and I had to go pack up my stuff. Monday, I took all my luggage with me on the tour bus to the fabric district. (I always do that, since it's so much easier to get to LAX from the fabric district with a shuttle or Uber, and just fly out that evening). I did have some nice finds in the fabric district - I bought two new Disney cotton prints for skirts for my shop (and a villain skirt for me! ), something like 15 yds of dark forest velvet ribbon,and 8.5 yds of forest green wool for my Winter Bustle. I rarely find reasonable wool in the fabric district, and while it was definitely more than I usually like to spend on wool (it was $12.50/yd), it was the perfect weight and color, and I haven't seen that color online recently. (Oh, and I can't think of the store name right now, but it's right across from the guy known for his wool in that sort of indoor area off of Maple, I think). No pics of anything, but you can see the fabric in my etsy shop, and if you're interested, it's available as yardage or in my simple skirts. We shared a Lyft back to LAX, killed time before flights, and then CoCo was officially over. :( Is it time for next year yet?